For a little more than the past month, I've been concentrating on the mountains of NC for photography. 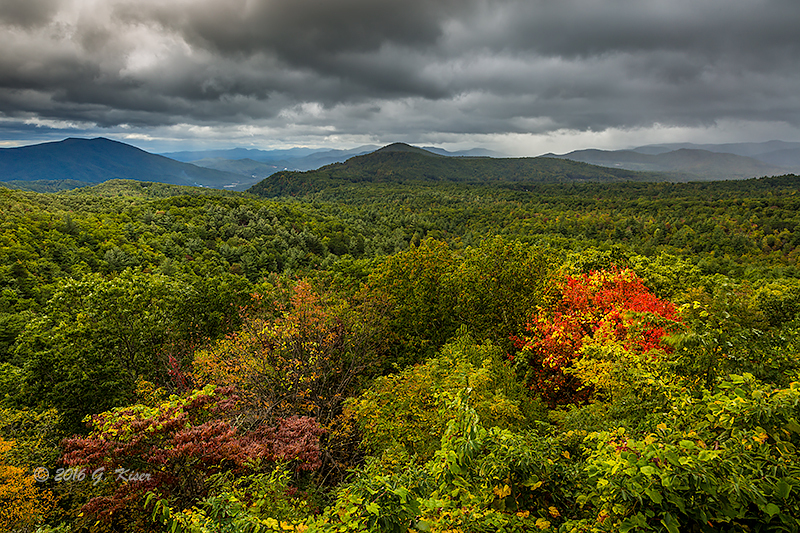 Of course, this is largely due to the season, and the chance to see the leaves changing. This has taken a large toll on my time over the weekends, but has been very much worth it. With the color about gone in the mountains, I can start setting my sights closer to home now. Since I worked all through the previous weekend, I did not have the chance to get out at all with the camera. Ironically, with the actual work week starting back up, I found that I had a little bit of time in the evening that I could get out real quick and hunt some pictures. The sky was a little boring when I left work, but the hourly forecast gave me some hope for some decent skies right before sunset. 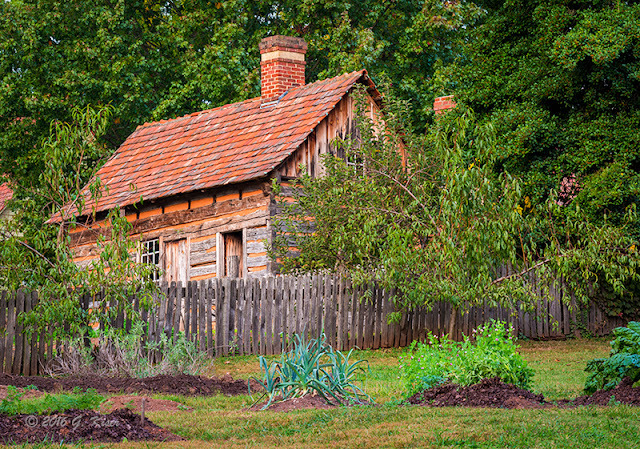 For some reason, I had been thinking about Old Salem, which is a historic location about five miles from home. I don't normally think about going here much any more, so that was strange. 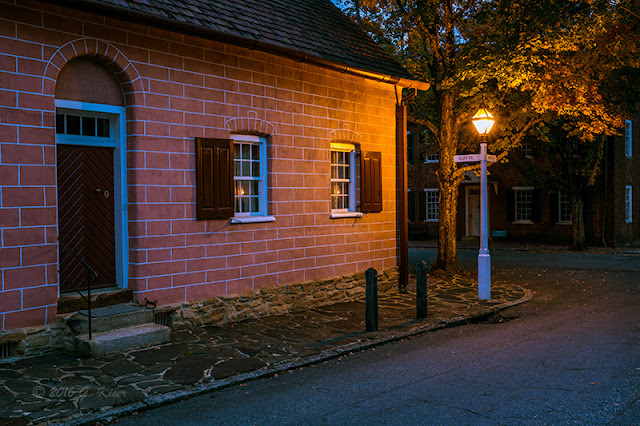 I've been to Old Salem several times over the years and found some moderate scenes that I could shoot, but overall, I was never overly impressed with the layout. 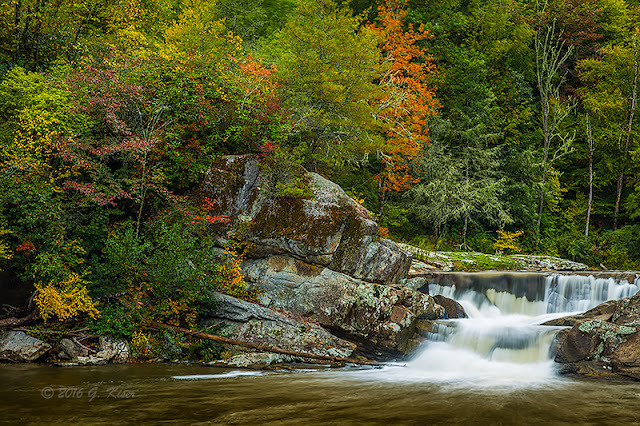 One thing that I have found over the years is that the Fall colors seem to be pretty vibrant there, if nothing else. With questionable weather, and limited daylight, I went with my urge to go to Old Salem. When I arrived, I was less than excited about things, but there was something pulling me into Old Salem. I've learned over the years that there are times when I get strange urges to go places with the camera. When I listen, I'm usually rewarded with some pretty good pictures. Considering how tired I was, I was actually in a pretty creative mood, and I was ready to try some new things. One of the first streets I came to had some very nice color in places. I happened to find a nice rustic gunsmith shop in close proximity to a bright yellow tree. This would be my first shot of the day. In the spirit of trying new things, I decided to use different glass than I would normally think about for this scene. While I have always used my mid lens (24-70mm), I decided that I would go with my telephoto 70-200mm instead. This would give me a different perspective, and would help to emphasize the background as much as the foreground. 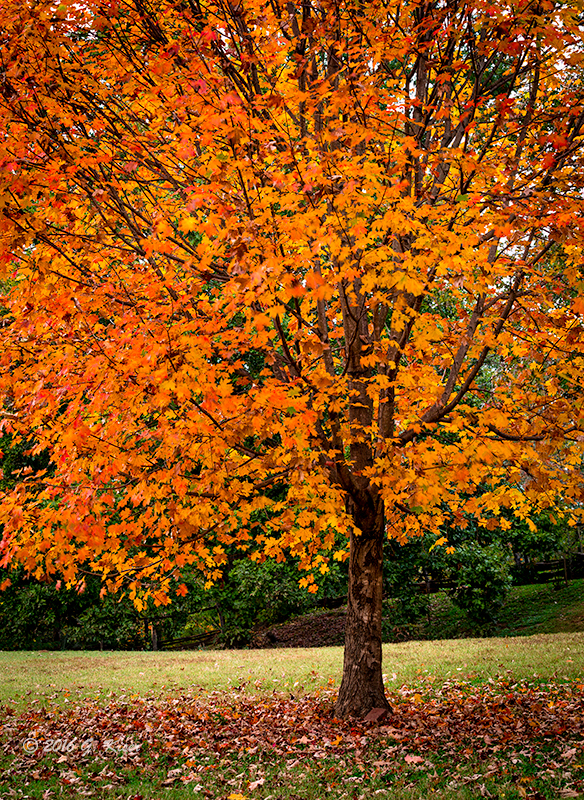 I added my Singh Ray Intensifying Polarizer to help bring out the color in the tree as well. Because of the reach, I had to set up a fair distance away from my composition. While this felt strange, the image that I was seeing in the viewfinder was well worth changing things up. I was instantly excited about how this Trek was going to turn out! Once I left the street scene, I was really hunting Fall color. I started to look for individual trees that were set apart from the others. It wasn't long before I found a lone tree, a maple, I think. It was close to one that I had shot before that really has a vibrant color to it, and it is also right over a bench. Unfortunately, that tree was still 90% green, and did not look all that special today. The one close by, however, was in full color, and had a little bit of character to it. It was worth grabbing a few shots of. I left the camera set up the way that I had it for the last scene with the telephoto, and color intensifier. I worked on a composition that utilized a fairly uncluttered background, while finding an angle that showed the trunk, while not letting too much of the sky through. That really narrowed my possibilities, but when I found the sweet spot, I knew I had it. Thinking back to one of my new photography mentors, Josh Cripps, I decided to fill the frame with what I liked. In this situation, I loved the colors of the leaves. That was what filled the frame for this composition. The fallen leaves provided a much needed balance to the bright leaves still on the tree, and I really like the composition here. Just in case I thought that the leaves were too much when filling that much of the frame, I cropped in a good bit, and used the leaves to frame the tree trunk. As I was focusing in on the trunk, I happened to notice something kind of spooky though. Maybe it was the fact that I was out on Halloween night, or maybe I'm just a sucker for the macabre...but I was looking at what appeared to be a rather dramatic skull in the bark. There was an eye, nose, and a creepy, grinning mouth looking to the right of the picture. It wasn't until I started to look at this in detail that I found a second, smaller skull below. If nothing else, this photograph gets an emotional response from me, and I see a certain animation in this static image. With the light quickly changing, I decided that it was best for me to keep moving rather than stay one place too long. 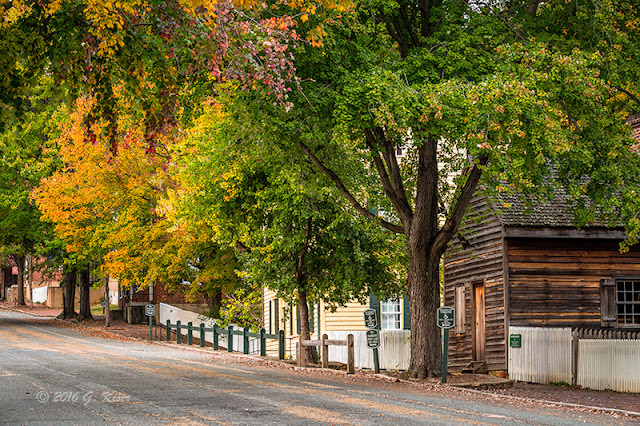 I continued on through Old Salem figuring that my ultimate destination would be the cemetery where there is usually a very large yellow tree right smack in the middle. That was what I was looking for, but I told myself that I would not pass up other shots along the way. One scene that I came upon was the Single Brother's House (If I'm not mistaken). I've shot this building a number of times, but never quite like this. Today, I was drawn in by the purple bush at the corner. That was really all that grabbed my attention. I thought about shooting the entire building, but the sky was generally overcast and not all that interesting. 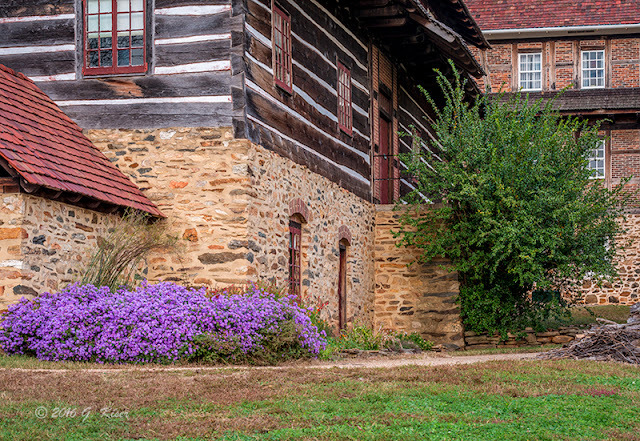 The building was also big enough that the size would reduce the scale of the flowering bush and make it barely a supporting player in the final composition. So, what I decided to do was leave my camera as it was, and shoot a tight composition using the building as a backdrop instead of a primary element. I was able to use a deep green bush as a counter element, and there was enough warm tones in the picture to give it a bit of visual drama. I wasn't quite sure I liked this one, and I asked Toni's opinion before I gave it my final blessing. She really liked it, and since I value her artistic opinion, I decided I liked it too. Again, today was about doing things different than I normally do them. As it turned out, there was a little garden on the other side of the street with a small house on the other side of a fence. It was mostly obscured by the vegetation and the fence, but there was something very German about the scene, and I liked what I was seeing. I decided to give it a try with the camera and see what I could come up with. There were two things going in my favor for this image. The sun was low in the sky, and was positioned over my left shoulder. This provided a nice warm hue over the scene, and helped to brighten the house. Second, the trees behind it were big enough that I could exclude the sky which was still rather boring. With my tele lens still on the camera, I started composing shots. I found that horizontal worked best for this particular subject, and grabbed a number of variations before deciding that the sun was dropping too low in the sky to keep the warm tones on the house. I decided to head back into the main section and keep looking while working my way to the cemetery. As I was walking, I happened to look to my left. At first all I saw was a white fence, but as my eyes started to explore the scene, I found a really nice tree framing what was almost a pink tree. I stopped in my tracks and heard Toni saying I had better shoot that. It was more of a squeal, but I got the message and started to look at the scene, trying to imagine what she was seeing. Yes, even when she is not actually with me, I know her well enough now to know what kind of pictures she likes. There was a lot here that I wanted to capture. 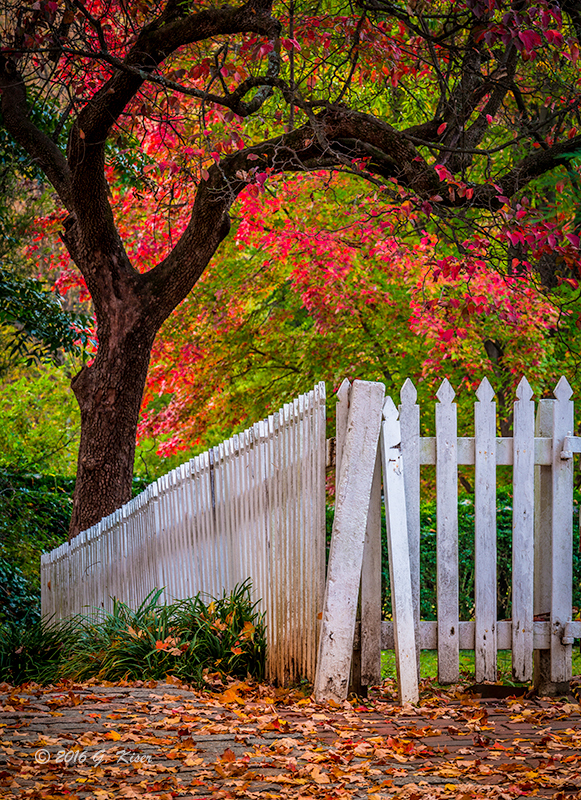 I really wanted to keep the tree as dominant as I could, and I wanted to keep the power of the fence in tact by photographing it as completely as I could. The colors would be a soft textured background for the scene. In order to do this, I figured that I would actually need to keep the telephoto lens on, and would need to zoom in a pretty good amount. As it turned out, the composition I liked the most was with the lens racked to a full 200mm, with me standing across the street. This is really different than the way I would normally shoot this type of scene, but I found that the resulting composition was yards away better than I was expecting. With the 200mm zoom, my depth of field was very shallow. In order to expand it to where I needed it, I stopped down to f/20 (to maintain sharpness, while expanding depth of field), and focused about a quarter of the way down the fence. With an exposure of five full seconds, I had to wait until the breeze died down as much as possible before tripping the shutter. The resulting image had several nice surprises. First of all, the depth of field was not quite front to back sharp. There was a noticeable softness to the background as the leaves fell out of focus. The lighting was not so much difficult as it was atypical for me. The scene was essentially backlit so the leaves carried with them a certain vibrance, and glow which contrasted beautifully with the shadowed tree trunk. There was also the contrast between the white fence and the dark wood of the tree. 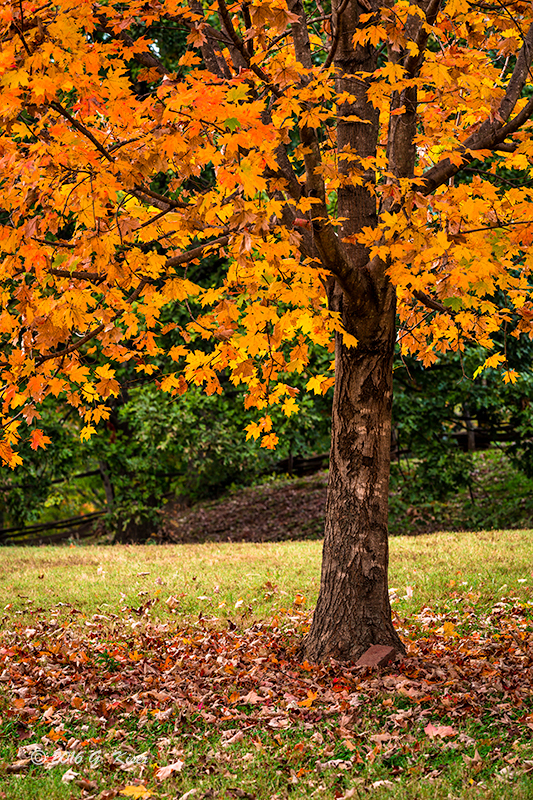 The fallen leaves introduced a wonderfully warm foreground which helped to make the colors in the trees pop. When I started to look at this picture critically, I found that I loved everything about it. The soft focus in the leaves, along with the back light, gave the scene an ethereal tone, and the shape of the tree was holding those leaves so gently. 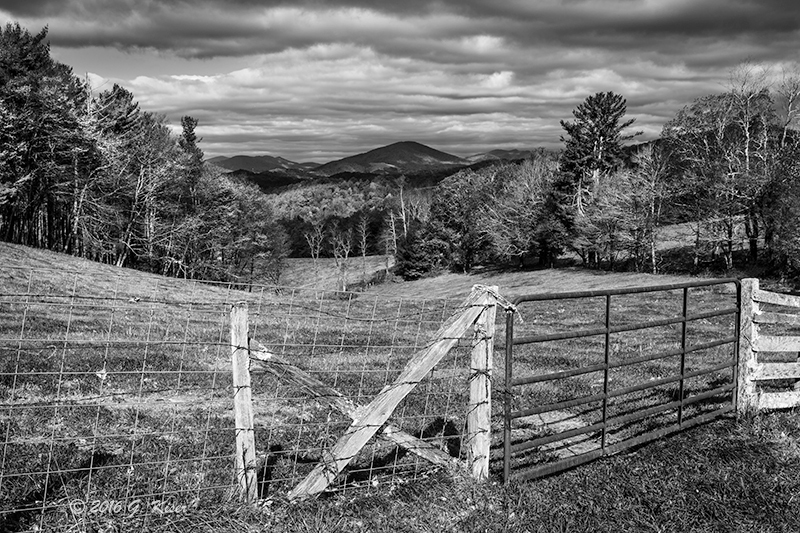 The fence was there as an obvious barrier, but for some strange reason, did not provide a visual obstacle to go deep within the image. However, the assumption can be made after seeing two sides of the fence, it is designed to keep things in. All of this worked together and made me think of a dream. Knowing that Toni has always put a lot of emphasis in her dreams, and has expressed an interest in dream catchers, the title almost created itself. Yes, this one was Toni's picture from the beginning, and remained right up to the finalized title of the print. Shortly after I shot Dream Catcher, I continued on to the cemetery and found that the tree I was looking for was still very much green. Not wanting to bypass any more potentially good images, I returned into the main portion of Old Salem. I stopped to talk to a resident for a few minutes, who gave me a bit of a history lesson before I continued on looking for other scenes. The sun was dropping fast, and the sky was not looking like a sunset was going to be all that possible. However, I decided to stick it out for a bit instead of packing it in just yet. I'm glad that I did because I found that there were a few places where the street lights were throwing a pretty glow on the buildings. I happened on one of these lights and decided that it was worth grabbing a few frames. After a quick read of the scene, I decided that I needed to swap glass, and go with my 24-70mm lens, and I needed to shed the polarizer due to the low light. I quickly got into position and composed this shot as the opening exposure. I would try a few more in the horizontal orientation, and a few additional in a portrait orientation. When it was all done, my favorite was my initial composition as far as balance and color. Again, it was not my typical picture, but I really enjoyed the process and result of shooting this one. With the end of the day quickly approaching, I struck out to see if I could take advantage of the sky which was starting to get some really good texture to it. The sun was down, so I didn't have long to find something, and that meant that I might not be able to be too picky. As I passed by the tavern, I noticed the woodshed behind was lit up from the inside, which was really cool. But even better was the fact that the sky was fascinating above it, and the wind was moving the clouds towards me, as opposed to moving side to side like they normally are. I set things up quickly, knowing that I had about five to ten minutes before the light was gone. In order to capture the sky, I left my 24-70mm lens on, and set up low to the ground. This allowed me to angle the camera up and into the sky. The clouds were moving fast, and with a 20 second exposure, I was hoping to see some movement in the sky. There was no time for any filters for this shot, I just composed, and exposed. Looking in the LCD, I was pretty sure that I had a winner, but can never be sure looking at the desaturated and flat image that the image review shows. 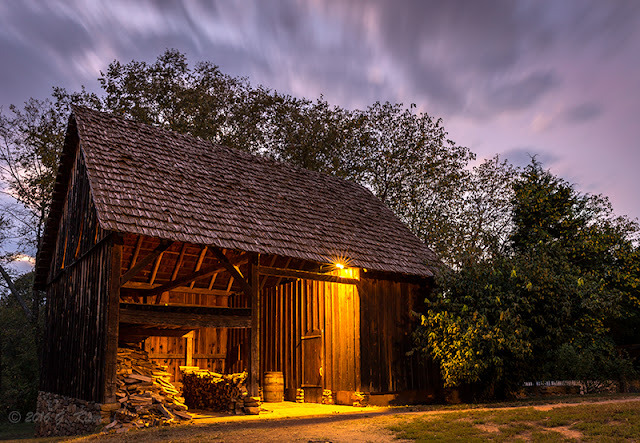 It was not until I got home and started to process the image that I was able to realize the scene that I had previsualized when I came upon the woodshed. There was drama, action, texture, mood, and it all played together so nicely. Again, this was not a typical image for me, and I was very lucky that there were lights on since I did not have a flashlight in order to light paint the shed. The highlights and shadows were a natural marriage, and the sky was the glue that kept the whole image together. I'm hoping to shoot more images like this one in the future! With the woodshed now in nearly total darkness, it was time to head back home and get some dinner. I kept thinking to myself that I really felt like this was a largely successful Trek even though I only shot 40-some frames in a couple of hours. It wasn't until I was done processing that I realized just how successful this outing had been. With eight images deemed keepers, I was well over my standard 10% keeper ratio, and just about every image was shot in a different flavor than I normally do. It is fun to keep things fresh, but when it comes to photography, it is always so much easier to keep things in your comfort level so you don't stand the chance to miss that one great shot. By experimenting, I have found out that I might not get the typical image that I like, but I'm finding so many other approaches to the same old scenes. Honestly, I'm really liking the different feel that my photography is starting to take these days. It is a constant struggle to kick myself out of my own ruts, but when I do, I'm overwhelmingly impressed with the results. As it turned out, I did very good listening to myself when I decided to go to Old Salem. Everything I shot today was done in a different fashion than how I usually do business, and that paid big dividends in the end. Now to pick what images go in the gallery! Me: What is that noise?.....Oh, it's the alarm. Starts to look at the weather in the mountains. Toni: Are you going to get up and go? Me: There are 30mph winds in the mountains today, and the wind chill is in the 20's. I should just stay home and curl up with you today. Toni: You really should go. This will probably be the last day you can catch the leaves. That was how my morning started at 4:15am. I really didn't want to get out of the bed, especially seeing the weather conditions in the mountains. The winds were up with 20mph sustained, and 30mph gusts forecasted. Not to mention that the temperatures were in the mid to upper 30's with a wind chill in the lower 20's. That was a complete shock to my system after being in the mid 80's just days before. But Toni was right, this was going to be my last good chance to capture the Fall colors in the mountains since peak was a few days ago. The wind would be better tomorrow, but I would lose the clouds which were forecasted to be about 45% coverage for most of the morning. This should provide me with some visual interest in the sky, and keep the sun diffused for a decent morning of photography. Honestly, I was tired. I have been in the mountains every weekend for the last month, and the long days were starting to wear on me. I didn't have much of a plan for this Trek. I figured I would wing it, and follow the light, and try to dodge the wind the best I could. I knew that above 3000 feet the trees were mostly bare by this point. I tried to focus on sections that were a bit lower to try and get some good color. 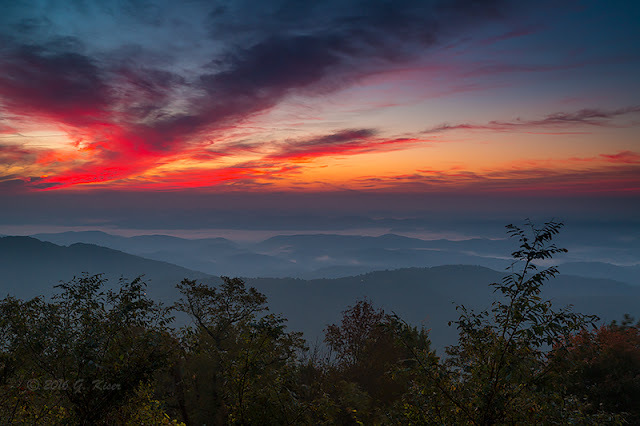 Since I was going to make a morning out of the Trek, I got to the Parkway before sunrise. I was not holding out much hope of a good sunrise though since there were no clouds in the sky. I wasn't surprised at this, since typically, 45% coverage means a single small puffy cloud in the sky. I started out headed South because I knew of a few really good places to capture a sunrise, should one appear. 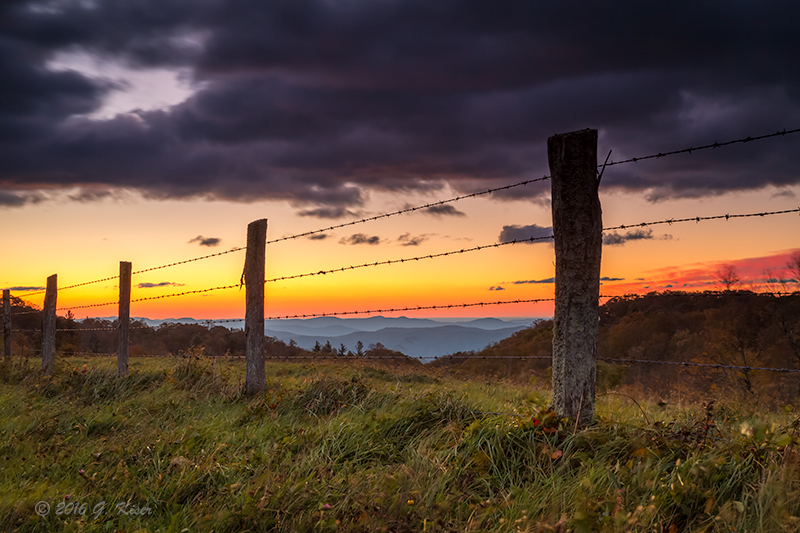 As I got close to Raven Rocks Overlook, I happened to catch sight of a fence to the left and I was pretty sure I saw a small patch of clouds over where the sun was coming up. This was an unknown vista for me, but it was worth turning around to check it out. Sure enough, the clouds were actually coming over the mountain and rushing toward the horizon. If I timed it right, I would be able to get some good color this morning. I parked the truck and opened the door....then considered how badly I wanted to try a sunrise. Ultimately, I fought the wind, which was howling at this point. I spread my tripod out for maximum stability as I was having flashbacks from when I busted a lens due to a sudden gust of wind. I decided to keep my 24-70mm lens on, but I fitted the Lee filter holder in anticipation for using my flat filters. I set up and tried to get the fence to contribute to the composition. 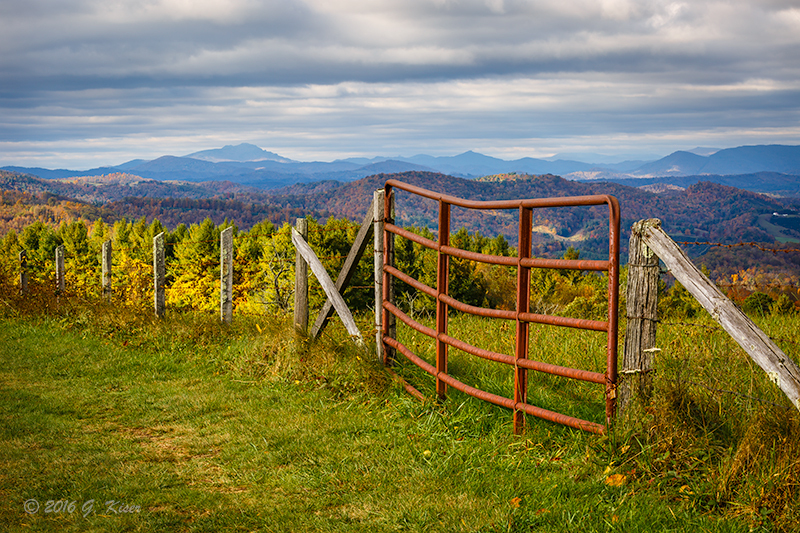 I found that by getting really low, the fence became a prominent feature against the colors in the sky. The wind was really causing problems though, as everything was blowing around wildly. For this level of light, my shutter speeds were not fast enough to freeze the motion. Instead, I had to time my shots with the lulls in the wind, and hope that they stayed calm for the duration of the exposure. That never happened though. The color in the sky was good, and the clouds held promise, but weren't moving fast enough. As the sky started to wash out, I realized that when the clouds lit up with color, it would be too late for the picture that I wanted. I'm just not a fan of a white sky between colorful clouds, and the ground. So, I decided to cut this short in favor of what was developing behind me. The clouds were much more dramatic to the rear, and I wanted to make use of the wonderful lighting before it was gone. There is just something magical about the light that the low sun casts when the subject is under an overcast sky. The warm light explodes under the moody clouds, and this was exactly what I saw was about to happen. I quickly got my camera in position, and pulled the reverse ND grad filter off the front. I wasn't going to be needing any filters for this shot. I just had to sit back and wait for the light to hit. The only problem was...I was getting numb. I could no longer feel my fingers, and my nose was running like a faucet. But I waited. In a window of about 3 minutes I had the light that I was waiting for, and I took advantage of it with several exposures to make sure I got it right. The composition was a little more difficult that I expected. I had set up a foreground, but there was a deep shadow that covered it, and with the wind, there was too much movement for my tastes. I had to crop in tighter in order to really focus on what was the most interesting. The change in composition was easier said than done with my numb fingers. Things like focusing became a chore, but the biggest issue was I was now switching lenses. For the composition at hand, I needed my 70-200mm. It was everything I could do to swap the lenses while keeping the wind away from the sensor. I was finally able to get the image that I wanted, seconds before the light faded. My body was telling me to put the camera away and get back in the truck. But, I saw in a slightly different direction another opportunity to catch the golden morning light. There was a single grove of trees atop a hill, where one of the trees still had about half of its leaves left. I was still using my long telezoom, so reaching the tree would not be a problem at all. The cows that were slowly walking my way were promising to cause some issues though. 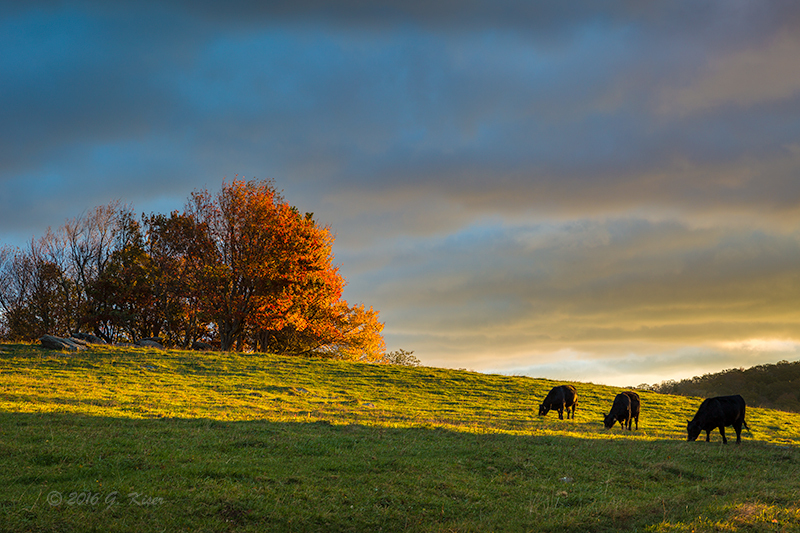 The last time this happened, the cows ruined my composition, and I had to abandon my location until they left me alone. These guys were not quite that bad. In fact, they didn't bother me at all. The bigger plus was they actually held still for me, and even faced in the same direction. I couldn't look this gift cow in the mouth, now could I? I opened up the composition and included them. This worked out wonderfully since the rising sun was lighting up the clouds to the right of the frame. This was good timing! However, in the world of photography, good light lasts just moments and then it's gone. With the sun quickly rising, I was losing out on the warm tones, and they were being replaced with very contrasty light. It was time to listen to my body and get back to the truck. It took some doing to get the camera put away though. I had no fine motor skills, and I could not tell what kind of pressure I was applying to buttons, and levers. I looked quite funny, but I eventually got it all broken down, and back in the bag. Then it was time to make use of the heater...on full blast! Now it became a game of find the light. On one side of the Parkway, there was bright blue skies. On the other, nice and dense clouds. Of course, I was looking for the clouds, but I wanted the sun to light up the landscape below...yes, I ask for a lot! I found one of my little favorite settings near a recessed barn that looked like there was promise. I was going for a lone tree on a slope. The composition was there, but the lighting was not what I wanted at all. However, the distant mountain range showed much more potential as the sun was dancing across the hills already. I moved over to that side, and started to compose the image using my 70-200mm lens again. I wanted to keep the distant mountains prominent, and using a wide angle lens would reduce their size too much. Because of the distance, I needed some form of foreground interest. Fortunately, there was a nice split rail fence that I could use. I just backed up and framed the mountains in the vertical posts. My one issue was the wind was still howling, and the weeds in front of the fence were moving like crazy. There was no chance of freezing them, so I went ahead and embraced the movement. I stopped down the lens, and slowed the shutter speed to a speed that I thought would provide enough motion in the weeds to reduce their visual impact, but keeping them detailed enough that the eye recognizes them without having to examine the form. It was a fine balance! The second element of this photograph is the light. The clouds were moving quickly in the wind and the light from the sun would illuminate various parts of the landscape randomly. I just sat there and made exposures when I thought the light was doing something special. For the most part, it was going across the nearest mountain, and would occasionally hit the one to the rear. For a moment though, the light hit both mountains, and also fully illuminated the middle ground for the first and only time. That was the shot I was wanting, and didn't even realize I was waiting for that formula. Once again, it was time to fumble with the camera and put it back in the bag. I couldn't feel my extremities once again. I needed to find other vistas to photograph while the light was still good. 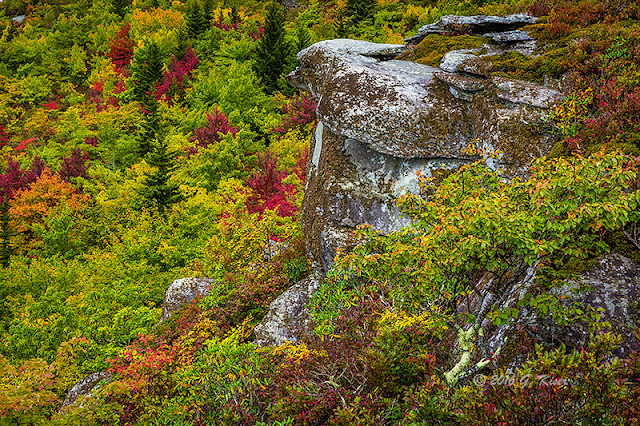 I got turned around at this point, and started heading North in search of more color. I could see that the closer I got to the Rough Ridge area, the less leaves remained. I was hoping for better luck on the Northern sections of the Parkway. 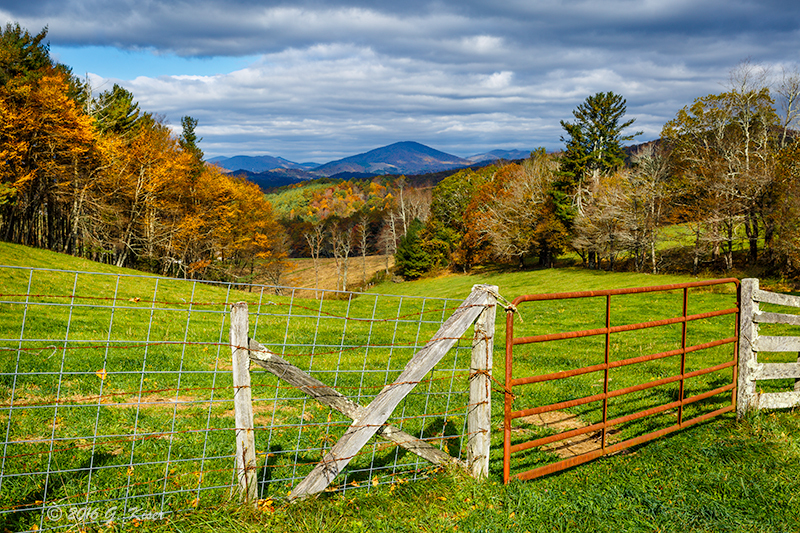 As I made my way North, I passed by a favorite section of fence that I've photographed many times before. With the clouds in the distance, I figured that I would continue that tradition. I pulled off the road, and built my camera, once again with my 70-200mm lens to keep the distant mountains in proper proportions. The histogram showed a nice and even exposure, so there was no need for any filters. I worked on several different compositions using the red gate as a visual anchor for the entire image. Since the last time I photographed here, the gate had been damaged. There was now a pronounced bend to it, and it happened to match up very nicely with the dip in the distant mountain range. It all seemed to come together very nicely looking at the image review in the camera. Just a little ways down from the gate is another scene that I enjoy trying to photograph. I'm not sure why it gives me such a hard time, but I've never been truly happy with the images that I've shot here. I really like the concept, but something with the way the colors and textures behave makes it feel weird to me. Today, I got to add in the colors of Fall to that mix which complicated things even more. However, the image that resulted had a drama that I have not experienced with this scene in all the years I've tried to photograph it. It turned out much better than I expected, and I was very happy that I gave it another try. I'm just wondering how much longer the dead trees in the front will remain there. In my opinion, they absolutely make the scene. After finishing this image, and trying another scene a short distance up the road (wasn't happy with the results), it was time to pack up the gear once again. I wasn't really sure where I was gong to end up, but things were going pretty well so so far. That is, if you forget the fact that my fingers were now tingling from exposure, and would not stop. Not too far up the road, I came upon another one of my favorite spots. The lighting was just right today, and I had to stop and give it a go. When I got out of my truck, I was about blown over by the wind. The best I could tell, the wind was being channeled through the very valley that I was about to photograph. I was essentially standing in a jet blast, trying to get a picture. Well, I was going to give it a try at least. Again, I have found one of those old red gates which seems to find their way into my pictures more often than not. Since the trees to the left were nice and golden, I wanted to counter that with the red gate. In order to do that, I composed the image making the gate the visual anchor. It was positioned directly opposite of the orange trees creating boundaries for the eyes, forcing them to go deep into the picture. The hardest part about this image was waiting for the wind to die down long enough for a steady exposure. The sustained wind was enough to make the camera visibly move, and that would make for a very soft image. I got my chance about 3 times and took advantage each time with slightly different compositions. Since it has been a while since I've done a monochrome conversion, I thought that this one would make a decent specimen for that process. While I like it better in color, it works as a B&W image for different reasons. The textures are what really draw me into the frame. The "X" in the foreground cradles the distant mountain which causes the eyes to follow through the image. I do enjoy working with monochrome images, and with Winter approaching, it is about time to start doing those again. The further I drove, the more the clouds were starting to break up. I can't complain though...the forecast showed them all but gone by 11am. Here we were coming up to about noon and there were still some really good clouds in the sky. That was good, because without them, I would have been done shooting as the mid day sun is just too harsh to work with unless the light can be diffused. 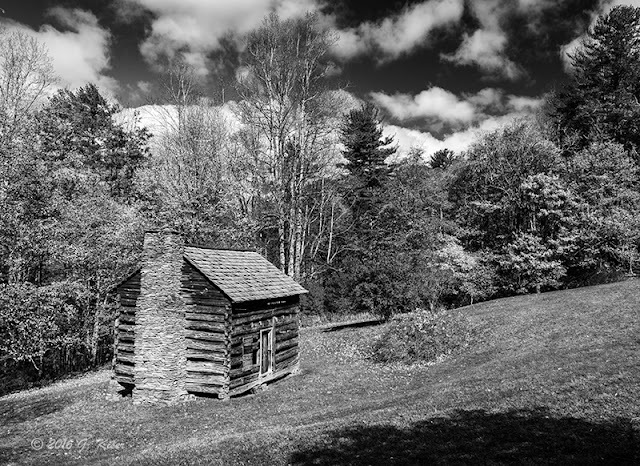 My last stop of the day happened to be a historic cabin which I photographed many, many years ago in the snow. I've not been all that interested in it since that time, but it was calling my name today for some reason. With my 24-70mm lens, I gave it a go. Since the clouds were breaking up, I went ahead and fit a polarizer on my lens to help with the contrast in the sky. For being a cute little cabin, it is not that easy to photograph. There is not much in the way of foreground interest, unless you count the bramble off of the corner of the house. By opening up wide, I was able to get the sky in the frame, and also a shadow in the foreground. More importantly, I was able to get the Fall color that was present in the background of the house. 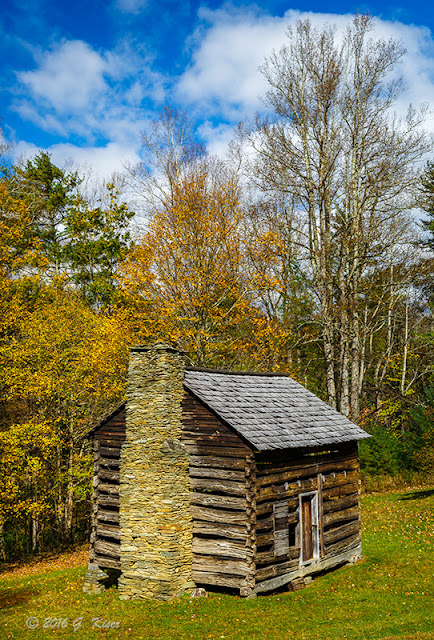 The cool sky balanced out the warm tones of the trees and the cabin and made for a nice, and well balanced image. Of course, when I got home, I wanted to see how this worked as a monochrome conversion. For me, the sky seals the deal and makes this a successful image sans color as well. It really felt good to get back into processing B&W images once again. It seems like forever ago since the last time I did one. With all of the wondering about foreground interest, I almost forgot to try a vertical composition. With the chimney, and the tall, bare trees to the rear of the house, a portrait orientation really lends itself to this old home. Of the two compositions, I think that this one is my favorite for the simplicity of it all. I still get the deep blue sky, and the warm tones of the main subject matter. The size of the house is very apparent with the trees in close proximity as well. After I was done here, it was time to head back home. It had been a very fun day on the Parkway. It might have been the excitement of fighting off the high winds, or it might have been the challenge of staying warm. I guess, it could also be the fact that I came home with quite a few new images to add to my collection. No matter how you look at it, I am glad that I followed Toni's advice this morning and went to the mountains once again. With my recent schedule at work lately, I have been racking up some overtime, and have been needing to burn some hours. As it turned out, I had the opportunity to take a half a day off today, and got my work done in time to take advantage of that. Before going in, I checked out the weather to see if there might be a chance of doing some photography during the afternoon. With mostly cloudy conditions, and a chance of rain, I was all set to go and do some waterfalls. 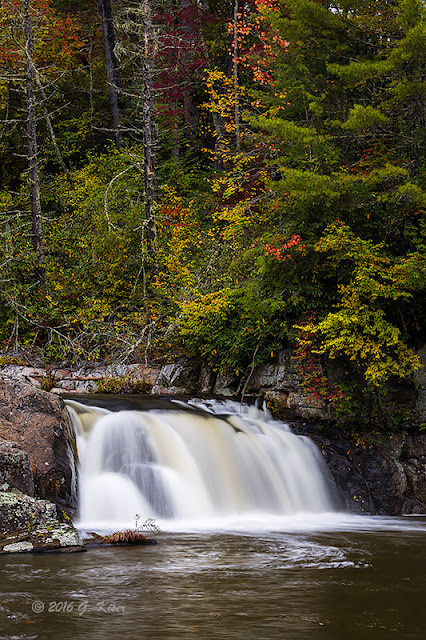 One of the closer waterfalls to me is not one that I have photographed all that often. It is in Yadkin County off of Styers Mill Rd. 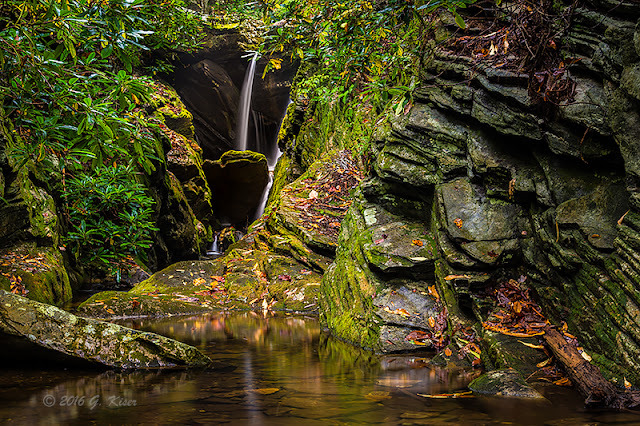 It is a really big waterfall for the Piedmont, and it can be rather pretty at times. The problem that I have with it is the vandalism along the sides of the falls. Years ago when I went there, there was spray paint on both sides of the falls which was very, very difficult to clone out in post processing. Because of the paint, it is very hard to make a satisfactory image of the whole waterfall. However, I'm starting to look into doing some more intimate shots of waterfalls these days, and wanting some practice at isolating specific elements of the falls. 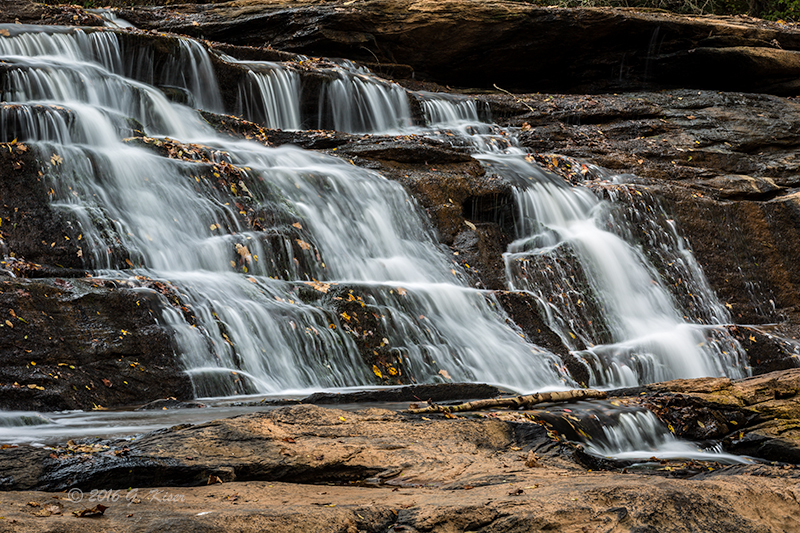 With the dry days that we have had recently, I figured this might be a good time to try this waterfall again. 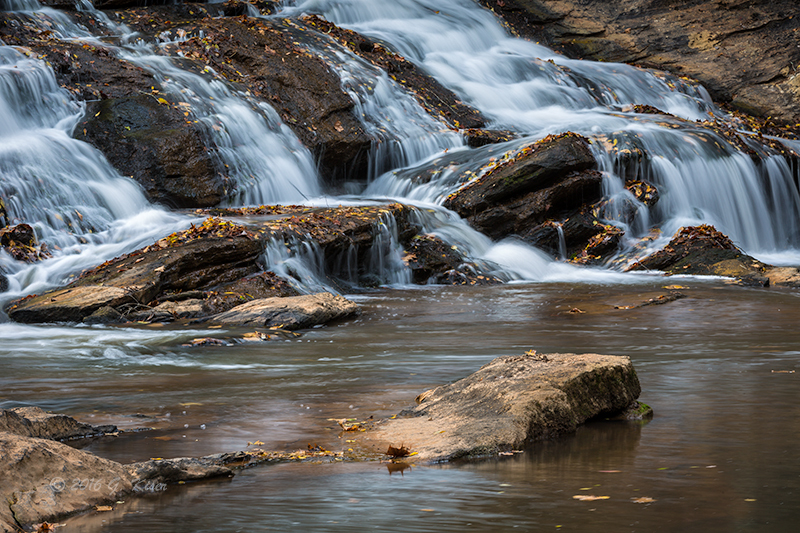 My intention was to work only with my 70-200mm lens, and keep the shutter speeds relatively quick for waterfall work. I wanted more detail in the cascades. When I arrived, I found that I had very mixed emotions. On the one hand, there was nobody else at the waterfall, so I had the place all to myself. On the other hand, there was evidence of all the people that had been there long before me. The spray paint was still there, and there were beer boxes trapped under limbs in the middle of the stream. There were also a few trees that had fallen since the last time I had been there, blocking the view of most of the left side falls. The weather was just about right though, so I decided to give some isolation shots a try. I picked out parts of the waterfall that really stuck out to me, rather than trying to compose a shot that encompassed everything. The results were pretty good, and I was liking what I was capturing, but was wondering about the lack of colors in the images. Seemed that brown was the predominant tone, and the rushing water was the only other hue to bring balance to the image. Fortunately, the water played a big part in these intimate images. It wasn't long after I started to make exposures that the clouds started to break up. I could tell that the sun was causing some major exposure problems in the water when I was checking the review image in the LCD on the camera. I was starting to get large areas of blown out detail which I didn't want. I needed to be able to capture all of the nuances of the cascading water to make these images work. It turned into a waiting game. I would compose the image and then set what I thought would be a good exposure when the light was right. I found myself around f/29 and 1.3 seconds for the most part. I would watch the clouds move overhead and try to time it to where they covered the sun. Sometimes, it was only seconds that I had to work with, but I took advantage of those seconds. However, the longer I was out there, the less frequent good light showed up. I decided to cut my losses and head out in search of other subjects that could actually make use of the sky. I started driving around and found the sky to be wonderful, but the clouds were quickly breaking up, and it seemed that in order to follow the the clouds, and good light, I was going to have to work my way back East. I was headed that way, and happened to pass by an old Pontiac I had photographed several years ago. 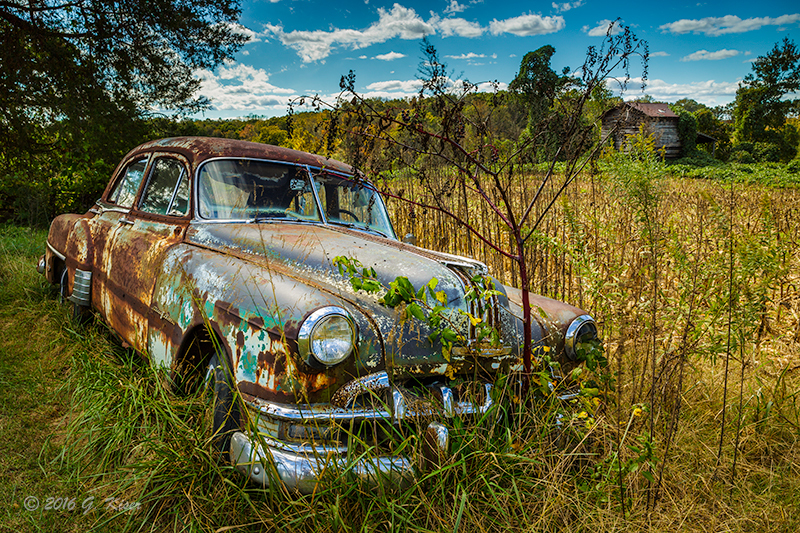 I've been wanting to work this old car again, but have been a little hesitant since I have seen signs of life on the property. Since it was the middle of the day, I felt that if anyone lived there, I would have a decent chance of catching them at home to ask permission to photograph the car. When I got there, the corn had all been harvested, and the car that was parked in the yard had not been moved in some time. I could see no signs of occupancy, so I decided to take my chances and grab the camera. I started out with the 70-200mm lens, but found that I was not able to get the compositions I was thinking I would with that much reach. I stepped down to my 24-70mm which is a very flexible lens, and it allowed me to get up close to the car from several different angles. Of course, by this time the sun was really not doing me any favors. Most of the clouds had faded, and moved to the East. I was here though, and I wanted to see what I could come up with on this car. There was a good deal of filter use for these images. 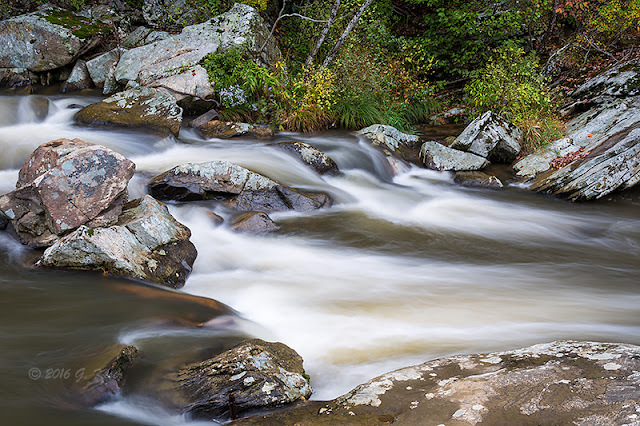 Not only was I using a polarizer, I was using in some cases, 6 stops of neutral density for the sky. It was not ideal, but the histogram was showing that I was capturing detail in the images without clipping at either end of the spectrum. That was promising. As with the first time I shot this car, the best light was from the rear of the car, so I spent some time back there once again. At least there was not as much need to hold back the sky when shooting from the back of the car. Once again, my favorite image of this car was from the rear. There are some interesting compositional tricks for this shot. There is a clothes line just off of the passenger side fender of the car. Sure, I could clone it out, but I really don't like doing that unless it is absolutely necessary. Instead, I decided to blend the posts in with the tree in the distance. You can still see both posts for the clothes line, however, they don't create a visual distraction because they become part of the tree in the distance which is a much more appropriate element to the image. There is a great sense of depth in the image because of the implied diagonal of the composition which I really like. 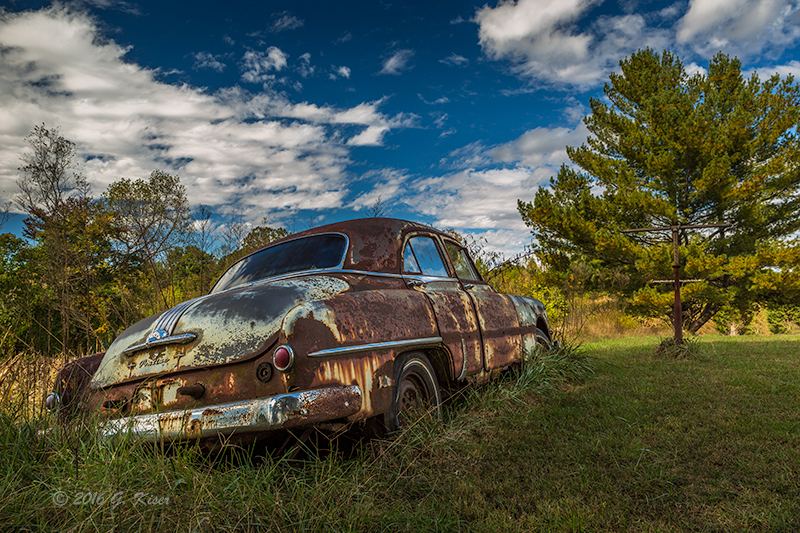 When I was finished working with the Pontiac, I found that the sky was pretty much awash with blue, and the wind was really picking up. I decided to head toward the house, and scout any other subjects I might could come back for at a later time. I found a few, but none would work in the current lighting, so I just made mental notes, and called it a day. It wasn't until I opened up the images in the computer that I saw that the RAW files actually looked better than I had thought they would. It is very hard to judge a picture from checking the LCD, which is why I mainly just look at the histogram to make sure I haven't lost any tonality in the image. They looked good from this objective measure, but the subjective measure had to wait until I could see them outside of the sun. I was pleased, but was really wanting to do more with waterfalls today. Oh well, I'll get them next time. Another weekend, another trek to the Blue Ridge Parkway. 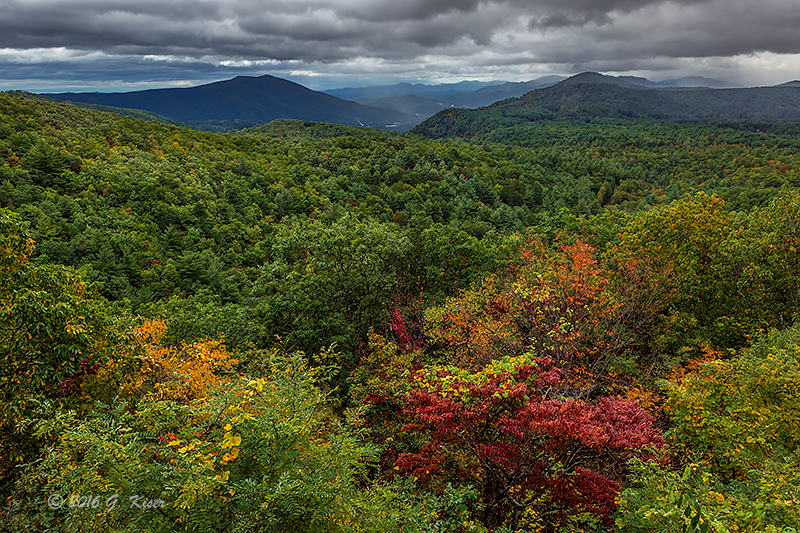 The Fall colors are slowly creeping into the mountains after a late start. My goal was to get out and find a lot of color to photograph this morning since this was supposed to be peak weekend according to the forecast not that long ago. The weather was supposed to be pretty good for my needs as well, so I had high hopes. I chose to start out around MP 276 and grab the sunrise from EB Jeffress Park, and continue North. When I got there, I saw that the moon was full, and tucked in behind the clouds in a way that made me forget about sunrise. 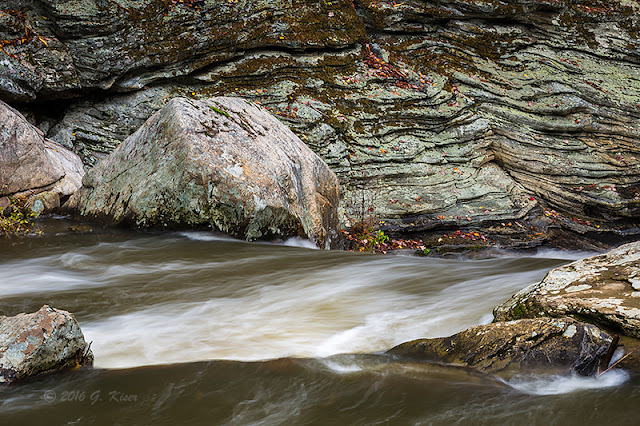 I started to chase the moon South until I found a great place to shoot it at Raven Rock. The problem was, by the time I chased it down, it was too low on the horizon, and had lost the impact I was wanting. Well, I was now about 10 miles away from where I was thinking about being for sunrise, so I moved on down to Thunder Hill since I know that there are several good options out there for different weather conditions. It was also pretty close by which was a bonus. I arrived about 45 minutes before sunrise, and found myself sharing the parking lot with about 3 other cars. By the time I was done, the parking area was completely full! I set up the camera with the 24-70mm lens since I was seeing some color already in the sky, and wanted to get a nice large field of view. I went ahead and screwed on my Lee Filter System so that I could use my 4x6" filters when the time came. I found my composition, away from the other photographers, and waited for the light to happen. Fairly quickly, I realized that I was going to need a reverse grad filter to control the sky, which I slid into the filter holder. It worked great, but with the moisture in the sky, I found that it kept getting covered in dew. That meant that after about every exposure, I had to pull it off and wipe it down with a lens cloth. It was like being at the beach on a humid morning! I continued shooting the sunrise as the sun came up, but before long the colors started to wash out of the sky, and I lost my interest. Funny thing was, there were now about a dozen or more photographers still going at it while the sky was getting blown out. Now was the time for my secret for this overlook. The best view is actually across the street, and up a little hill. The clouds were right for this one, and I just had to wait for the sun to finish coming up. Funny thing about this location this morning. While everyone was still working the sunrise on the other side of the road, I actually joined another photographer at the fence line while I was working on this image. She wasn't concentrating on the landscape though, she was shooting a portrait for a friend. She had the big flash umbrellas and everything out there. I wasn't quite sure what to think about this, but we both were able to work our ideas out without getting in each other's way. I'm not sure what she got, but I'm quite happy with the alpenglow that I captured as the sun came up behind me. When I decided to call it a morning, I looked around and there was nobody left at the overlook. The portrait photographer had left just a few minutes before, leaving me all alone. This was a much more relaxing environment for me, but the light was all gone at this point. It was time to move on to the next overlook and find some great scenics. Well, all that moisture in the air caught up with me. 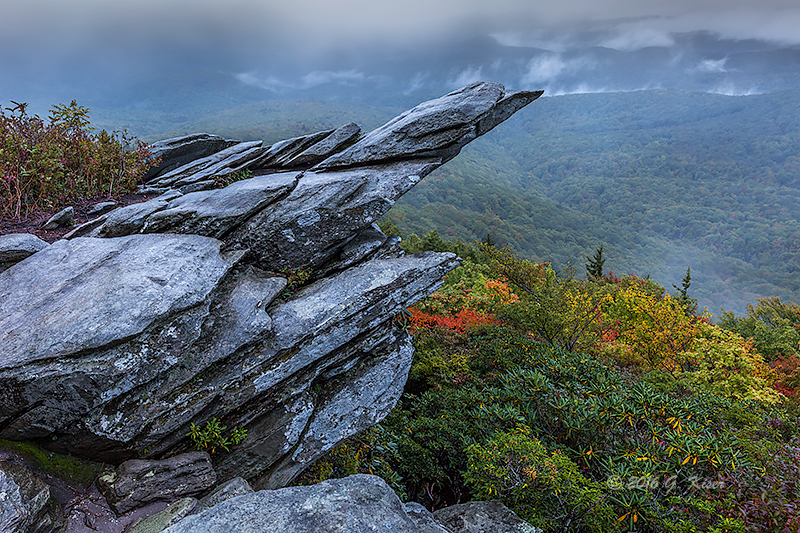 The clouds were now enveloping the Parkway, and nothing was looking good to me at that point. In fact, it was very much overcast above, with a haze at ground level. This lighting is best used for intimate landscapes, deep in the woods. Well, I was close to EB Jeffress Park, so I continued back up that way. I stopped for a moment at the historic cabin and fired off a few frames, but the lighting was not near good enough to make this a satisfactory image. I packed it in, and continued up to the main portion of the park. I was hoping to take advantage of the clouds and get a quick waterfall image for the morning at the Cascades. I was very fortunate that I was all alone on the trail since the viewing platforms are quite small. I made it to the bottom platform which provided the best view of the cascading waterfall. Once upon a time, I could go off trail and get a more full view, but over the years, they have blocked that access, and it has grown over. Not wanting to fall down the slope, I opted to stay on the observation deck. I fitted my 70-200mm lens with a polarizer so that I could isolate portions of the waterfall, instead of trying to get a large view of it. This worked out great, and I managed to get several intimate views of this waterfall. In about 20 minutes I was done, and hiking back to the truck. I continued North, but found very little that caught my eye. 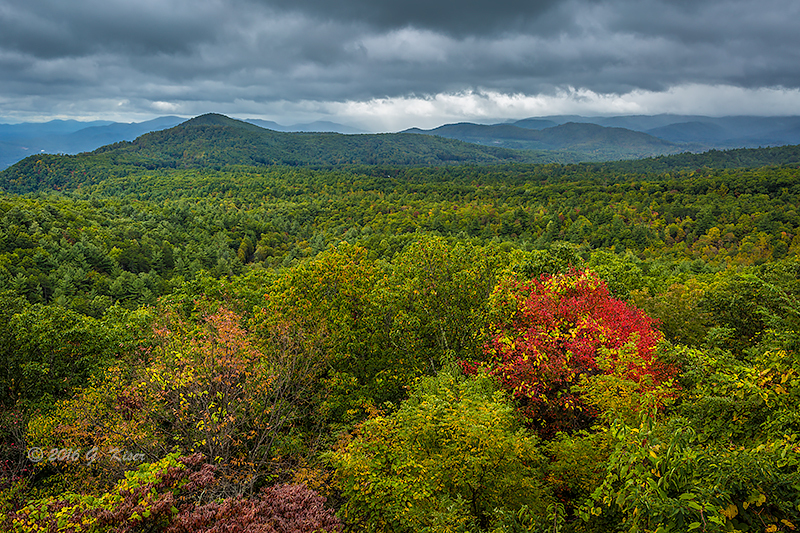 The weather was starting to clear, but the color on the trees was not all that great. I was hoping for something a little better when I got to Doughton Park since it was a little higher up than the areas I was in today. When I arrived, there was a music festival going on, and they were directing traffic into the park. I almost decided against turning in for fear that there would be a lot of people in the park. I'm glad I opted to go in though....I was just about alone in the actual park area. I was greeted by some pretty nice color inside of the park. 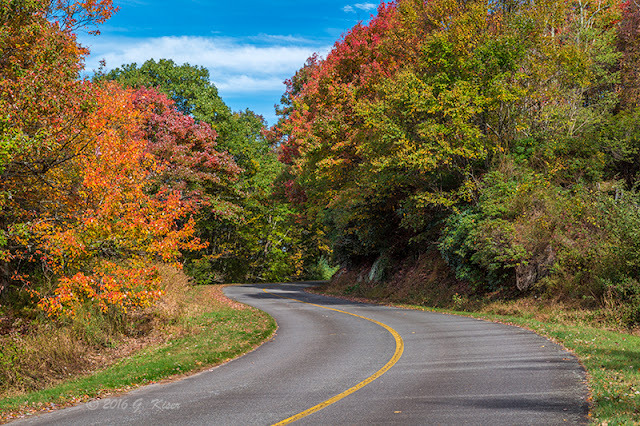 Some of the trees were so vivid, I was forced to set my camera up in the middle of the road and capture a few views. I didn't have much time to set up since it seemed that every time I started to set my focus, a car would drive by, forcing me to pick everything up and move from the road. I finally timed it just right to get this shot which was very happy with since I managed to capture one of the puffy clouds above. 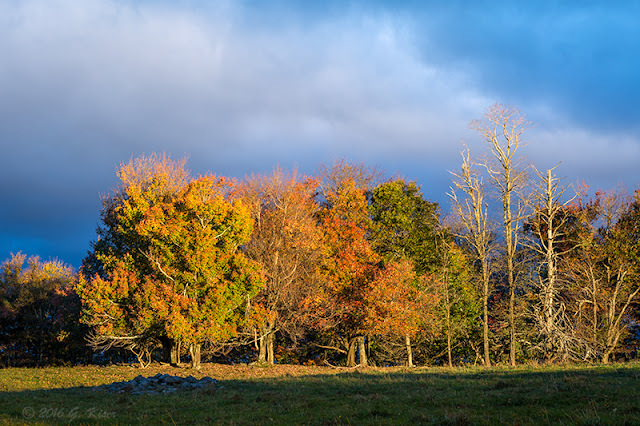 While everything had not changed in the park, there were some prominent trees which were showing a great deal of color. I chose to work with these trees for a while. Using my 70-200mm lens with a color intensifying polarizer, I started to pick out some views that put the trees in the best light. Occasionally, I had to include things like picnic benches, but at least I was able to make it harmonize with the other elements in the park. 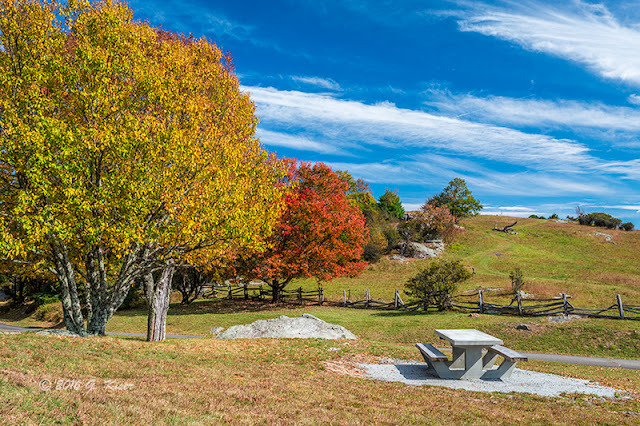 This is always one of my favorite stops on the Parkway, and Toni and I have some very special memories here. My favorite image from the park is here. The lone red tree under the deep blue sky really set the tone that I was wanting for the day. I didn't get a lot of images that fit this description, but I did get this one, and that makes me happy. There is just something fun about Fall photography. I just really need to get better at picking my locations since the color is only there for a short time. I always seem to miss the peak of the season for one reason or another. 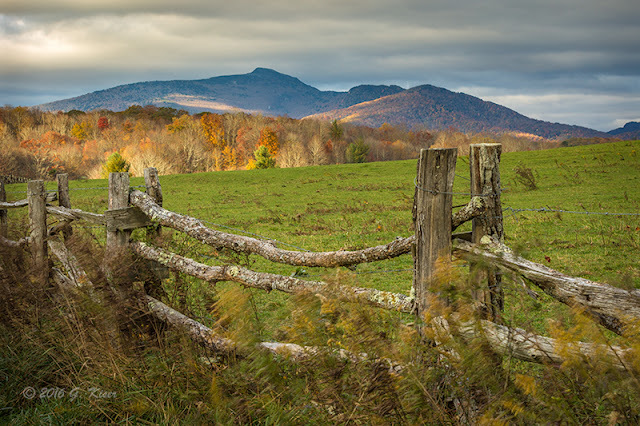 This year is getting going kind of late, but at least I am making it out to the mountains rather regularly to try and capture the color when it appears. After Doughton, I was running out of usable light. It was high noon, and the light was too contrasty for my tastes. I could have stuck around and killed time till later in the evening when the light started to improve again, but there was no guarantee that I would have good conditions. So, in order to make the most out of my day, I decided to pack it in, and head home...with one more stop. 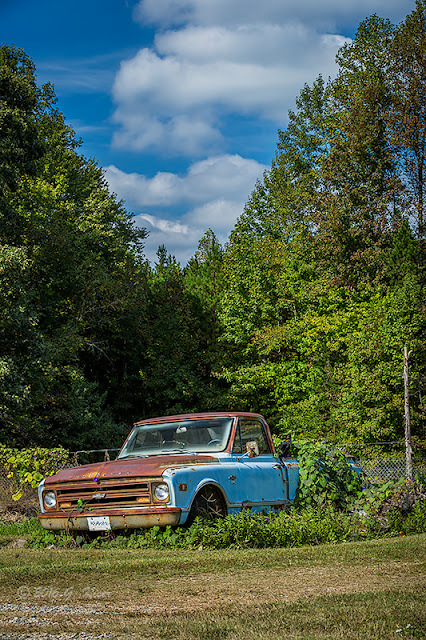 For years now, I have been riding past this old Chevy truck near the house. I've wanted to photograph it several times, but never really had the right day for it. The clouds were still pretty decent close to home, and by the time I got there, the light was a little softer than it had been in the mountains. I decided to give it a try. It was simple enough to photograph because most of my options were eliminated due to extraneous clutter on either side. The sun was in exactly the right position for this truck though, so it was worth a few shutter clicks. I used my 70-200mm lens again to isolate the truck, and added a polarizer to deepen the blue sky and remove the glare from the windshield. The formula worked out pretty well, and I was rewarded with a couple of pretty good images. I'm not sure which of these compositions I like better. I like the up close and personal view of the landscape composition, and you can better make out the purple flower growing beneath the hood, but the portrait version has a better balance I think with the blue sky above. 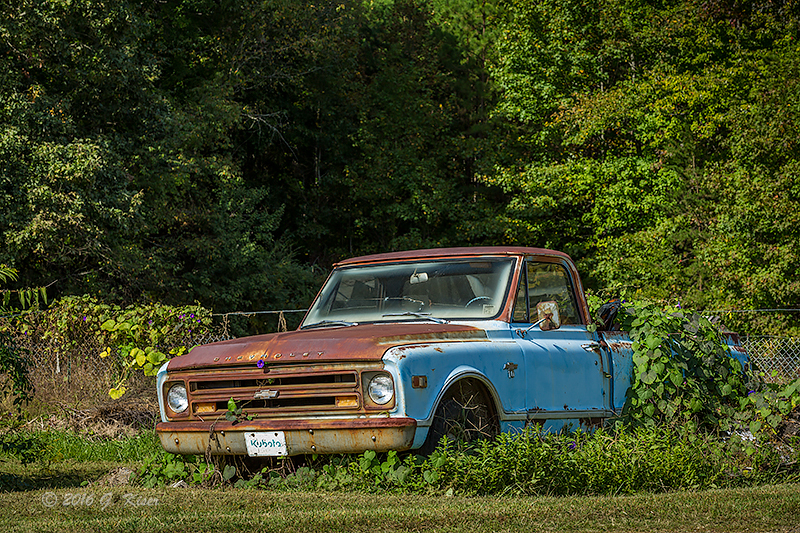 Either way, I'm happy that I took a few minutes to grab a couple of shots of this truck. By the time I rolled in the garage, I had a total of 132 frames on the camera. Most of those were me repeating shots waiting for the light conditions to change. Because so much of the images were repeats, I don't feel bad at all that only eight of them were deemed keepers. For a half day worth of shooting, that was pretty good. 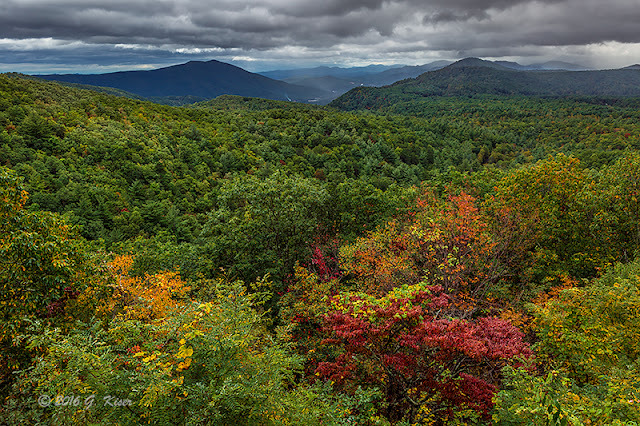 Here in North Carolina, October means the leaves start to change color in the mountains. 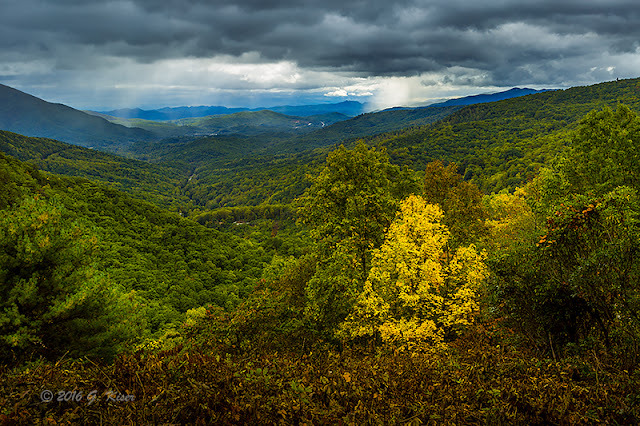 Historically, when I've been doing photography, I would try to get out to the mountains right at peak to photograph the leaves in full swing. I'm doing things a bit different this year, and I'm making it a point to go to the mountains every weekend in search of Fall Colors. 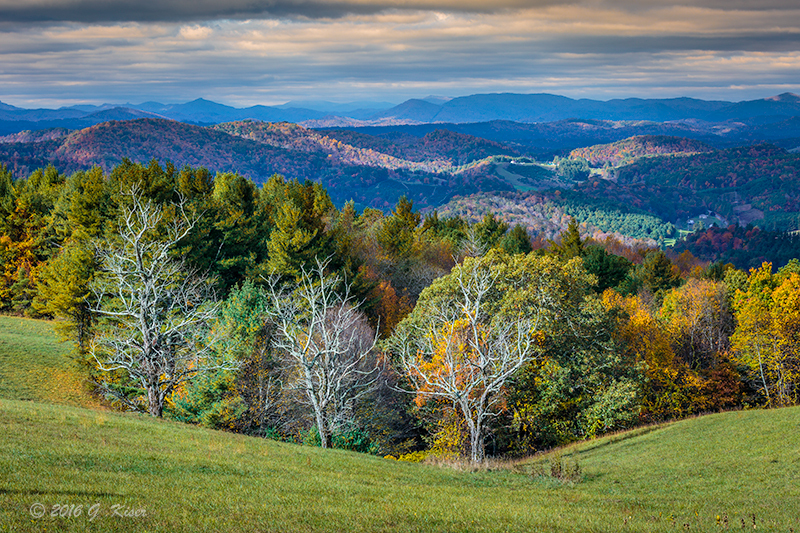 This marks the third weekend I've been out to the Blue Ridge Parkway so far, with one more in the works. Hurricane Matthew made landfall late in the week, and started to severely affect the weather patterns in NC, clear out to the mountains. Ironically though, I was looking forward to the freaky weather, and was ready to embrace it come Saturday morning. I woke up early...about 3:45am so that I could get out to the Parkway in time for a sunrise. 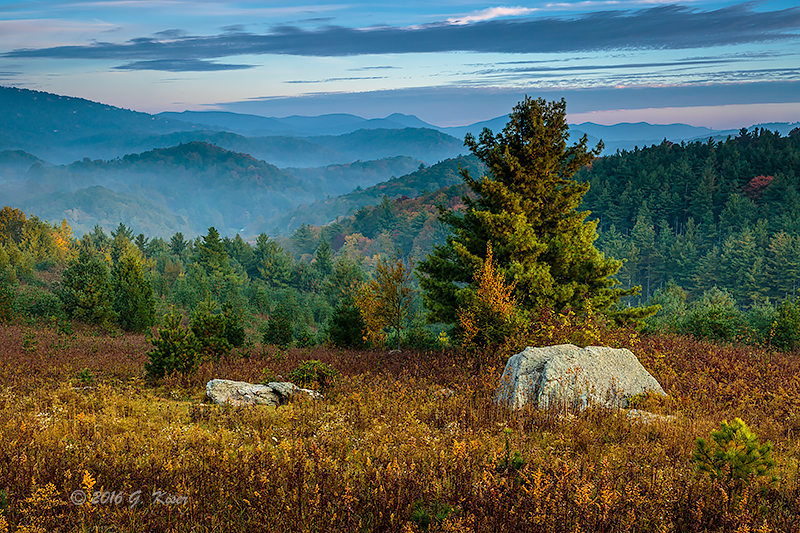 My plan was to head out to Rough Ridge, and work a slightly different angle than I had previously for a sunrise. I figured that getting there long before sunrise would cement me a solo visit to the trails. My hope was to be all alone, but the reality of the situation wasn't quite what I was expecting. There was already a car in the parking lot when I arrived, and before I could get my bag on, another car showed up. The folks in the cars obviously knew each other as they started carrying on loud conversation about hiking in the dark. Oh goody, I get to share the trails with what appeared to be ASU students. Oh well, as long as they were hiking, they would not bother me. They got a head start on the trails since I was still getting things ready at the truck. I could keep track of their progress from their talking. It is amazing how far a voice carries in the mountains in the early morning hours! As I made my way along the trail, I could hear that they were still moving, so all was well. It was when they stopped going forward that I got a little worried. It sounded like they had paused on the boardwalk. Great....now I was going to have to listen to them while I was trying to internalize the atmosphere. Well, it was worse than that...they were now sprawled out on the precipice that I was planning on setting up on. They had bags to sit on since it was raining lightly, so it did not appear that they were going anywhere anytime soon. I had to make alternative plans for sunrise. That was ok I suppose, since the clouds were pretty thick and I didn't really see much chance of morning color like I had hoped for. I continued on though the trail in search of another vantage point I could take advantage of. I found what I was looking for in a jagged rock outcropping. I could photograph it three different ways, just in case the sun decided to light up the sky. Of course, that didn't happen, so I climbed up on another outcropping and set the camera up, pointing Southeast. The elevation allowed me to exclude the sky for the most part, and use the distant terrain as my backdrop. Exposure was a little tricky with the extremely dim, and cool light. I managed to get it set up without the aid of filters which was great. That allowed me to use my lens hood on my 24-70mm to keep the front element dry in the early morning mist. When I was done, there were a pair of other hikers that decided to climb up on the outcropping and take their own pictures. They didn't even see me until they had started to climb up on the rock. I think I scared them a little bit. It wasn't long and they were done. The sky was making it so that I was done as well. From here I continued hiking along the trail to see what else I could find. My hopes were not high as there was very little detail in the early morning sky, and the wind was a little high to worry about photographing intimate landscapes within the trails. What I found was another small outcropping with trees at the end of it. 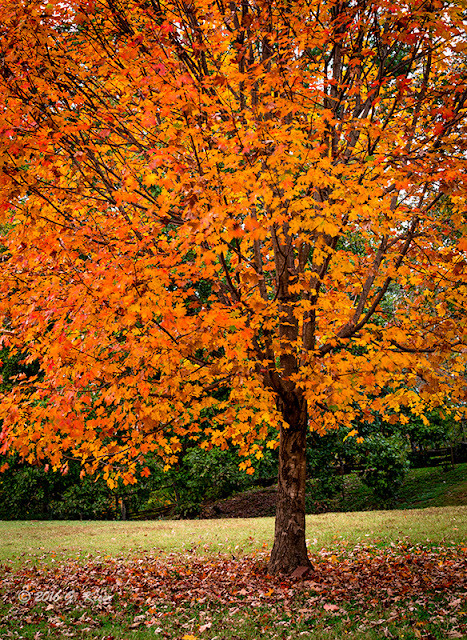 These trees were bright orange, and really captured the mood of Fall. The trick was going to be getting the sky to expose correctly behind the tree. Again, I was able to work with no filters since the lighting was fairly even. The part that was hard was the waiting. I waited in this spot for about 30 minutes waiting for the sky to do something interesting. It finally got some detail in it, and gave me a picture for about 20 seconds before the clouds covered it back up again. Oh well, that 20 seconds was all I needed to grab this shot, and at least the wind died down for a bit so that I could keep the tree nice and sharp. I hiked for a good little ways on the trails, but ultimately found nothing all that entertaining. I decided to turn back around and head back to the truck again. As I passed by the boardwalk, I noticed that everyone had left. I went ahead and stepped out on the primary outcropping to see if my original idea for a composition would work out. The idea was good, but the lighting was not right for it now. However, the distant mountains were looking pretty good, so I decided to set up and give them a try. I started working with another outcropping as a foreground interest. The composition was good, but the clouds were not feeling quite right for the image. I tried a couple of different things and finally settled on the above picture. I found that the better compositions were actually looking straight into the the side of the mountain instead of finding the sweeping vistas. It has been a long time since I've photographed this particular outcropping. It only looks right in the fall when there are splotches of color all around it. It was looking pretty good this morning, and after I attached a color combo polarizer, the colors really jumped out at me. It only took a few frames to be satisfied which was good because the rain was starting to be a big problem for my lens and filters. It was time to pack it up and head back down the hill to the parking lot. As I made my way down the trail, I looked behind me and saw an interesting composition developing. 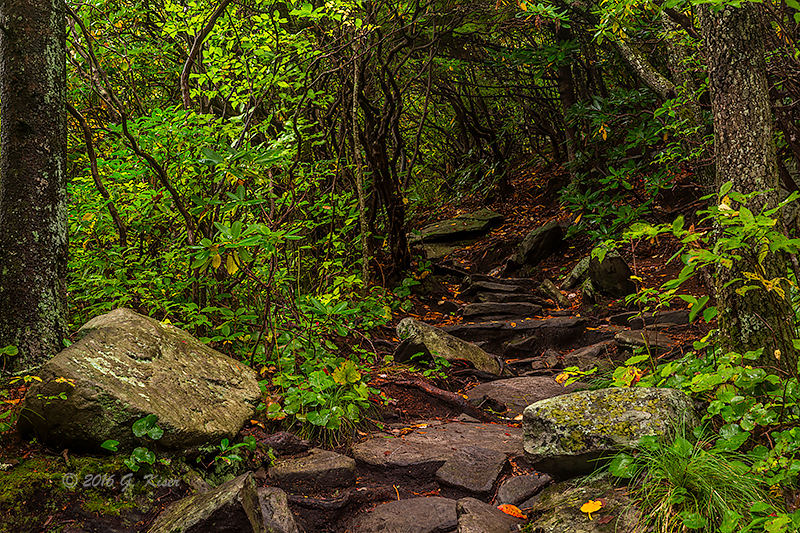 The winding rocky path, and the slightly curved trees made for something like a portal. I was hooked, and went ahead and built the camera once again. This was a slightly difficult shot to make. It wasn't the exposure, or the composition that was causing me problems though...it was the wind. Because of the dim lighting on this section of the trail, my exposures were all in excess of 13 seconds. Every breeze that came through caused the leaves to move, and thus blur. With a good deal of luck, I was able to get the timing right a couple of times, so that everything rendered sharp and motionless. While setting up the shot, I did move a couple of leaves to the front of the frame. The yellow and orange leaves you see to the right, were moved from a point closer to me, but out of the frame. I felt that the splash of color would benefit the composition. As I was leaving, I stopped to photograph the foot bridge, but really didn't find anything significantly different than what I had done before. Since the leaves hadn't really changed at this point, I decided to trash the pictures from that location. I did meet another photographer while I was working on some of the compositions. 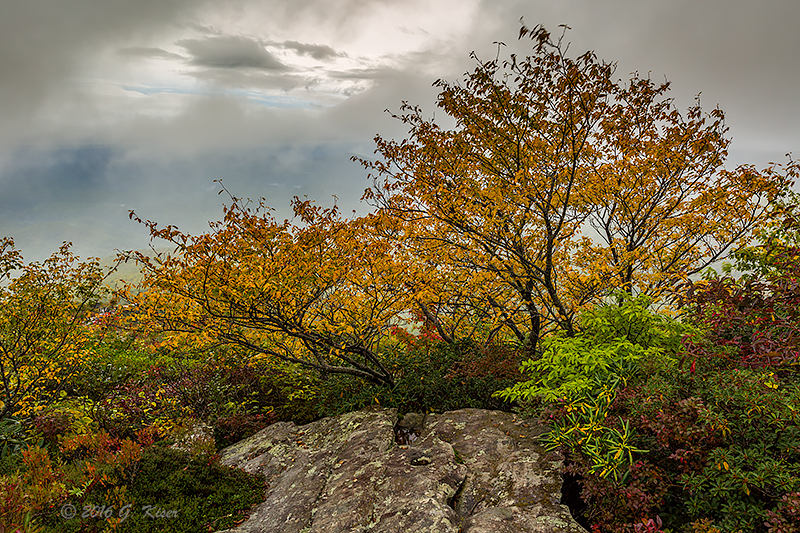 He was also out in search of leaves, and like me, was a little disappointed in the lack of color along Rough Ridge. With the altitude, this is usually one of the first places to change in this section of the Parkway. He did let me know that Linville had a good many trees that had already changed. 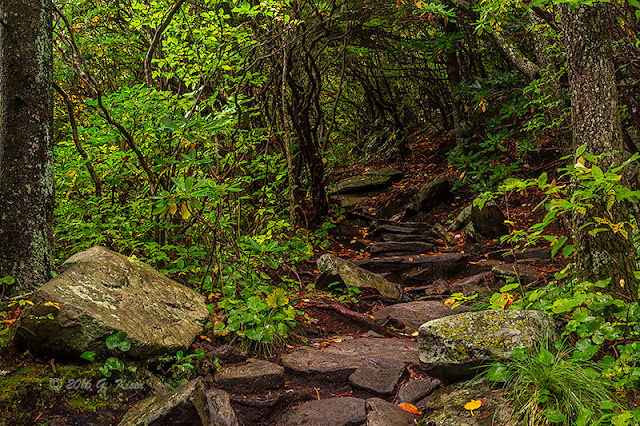 With that information, the Linville Gorge turned into my next destination. 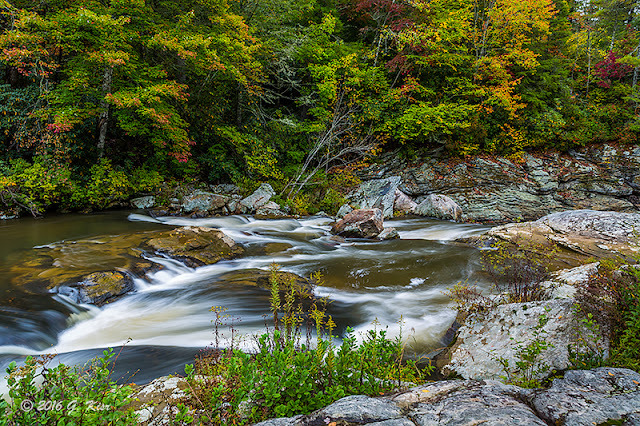 As I got closer to the Linville Gorge, I could tell that there were a good many more trees that had changed which is quite strange. The Linville Gorge is at a lower altitude, and therefore should change after Rough Ridge...but I was seeing it with my own eyes. There was color to be had here, it was just a matter of finding the right composition to showcase the color. I decided to go on a little hike at Linville Falls. 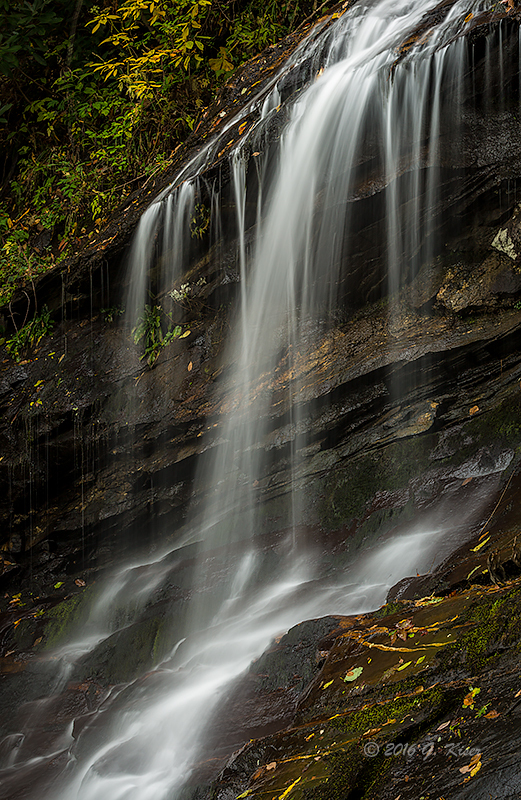 It has been a long time since I've been here, and with the cloud cover, it was a good day to work waterfalls. Apparently, I wasn't the only one with that idea though. The parking lot was nearly full, and there were people milling around as far as my eyes could see. To avoid the crowds, I decided to go down the self guided nature trail to see Dugger's Creek Falls. 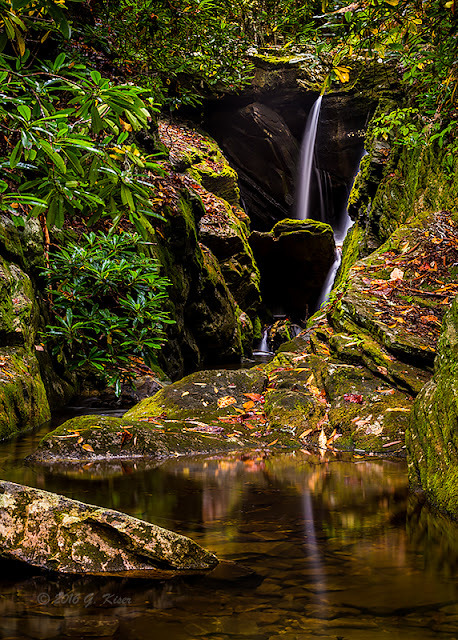 This is a favorite of mine, and I was hoping to find it with good water flow today. The hike was uneventful and I didn't see any other hikers which was great. I went ahead and dropped beneath the bridge, and started standing in the water which I have become quite good at over the years of doing waterfall photography. I already knew that I was going to need the reach of my 70-200mm lens due to the layout of the cavern the falls are in. This waterfall works well in both horizontal and vertical perspectives, so I did both to make sure I had everything covered. As I was shooting, about 10 or so hikers came by, walking over the bridge, and some even came down to where I was. I don't remember ever seeing this waterfall so busy, but I guess it is due to the season, and I will have to get used to it. I played with Dugger's Creek Falls for about 30 minutes or so before I packed it all up and started back out to the main trails. I wasn't looking forward to being in with so many other people, but I wanted to do more waterfalls since it seems like forever ago that I photographed one. I was also hoping that I was going to find some nice fall color along the way as well. 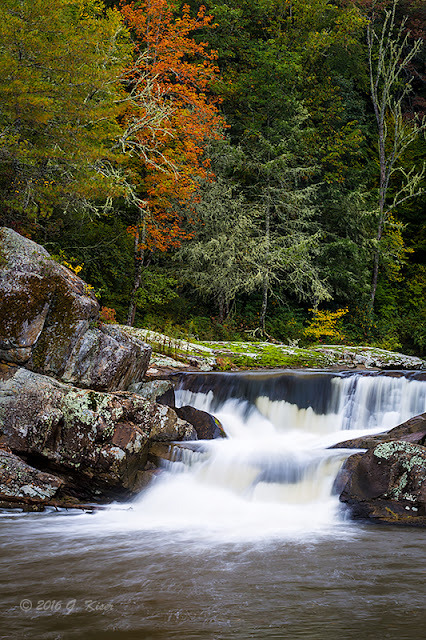 I followed the first trail that I came to, knowing that it would take me to the upper falls, and three different viewing platforms of the Linville Falls. I wasn't overly interested in getting the big waterfall today because I knew that everyone and their mother would be out to do just that. In turn, I decided to check out the Upper Falls. It has been many years since I have been here to photograph the pair of cascades, and the subsequent rapids that flow to the main falls. I was a little surprised to see about 35 people in the viewing area for these falls. I've never seen it this crowded. I was here, and I saw some color, so that meant I was going to have to deal with the crowds. 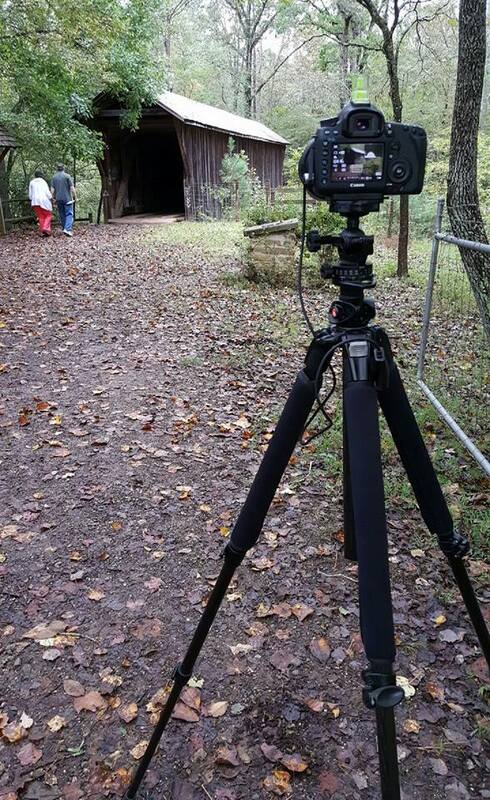 I found a little place out of the way to build the camera. I chose the 70-200mm to start with, and then ultimately swapped it for the 24-70mm. I used a polarizer, and occasionally an ND filter in order to get the shutter speed where I wanted it. The last time I worked these falls, I made the mistake of trying to get both waterfalls in the same picture. That was a mistake, and resulted in a rather boring composition. This time, I went about it a completely different way. I isolated each waterfall, and worked them independently from one another. I found that this was a much...MUCH better approach. With the heavy rains we have had recently, both of these waterfalls were full of character. I don't remember enjoying them nearly this much the first time I photographed them. Yep, despite the hoards of people, I was very much enjoying myself. Waterfall photography has always been a fun thing for me, and now that I don't get to do it that often, I relish it when it's possible. The crowds were increasing, with another 15 or so added just since I arrived. However, they were all very respectful of my space and asked any time they walked in front of me. That really made it much more tolerable. If only I could keep the rain from blowing directly into the lens of my camera! 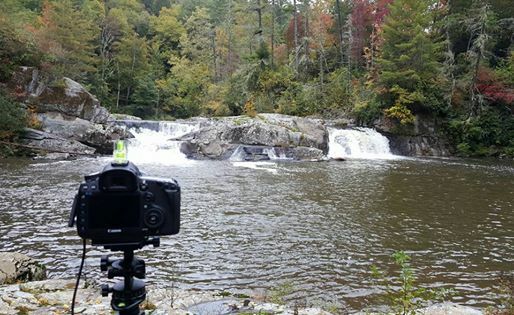 In order to point my camera away from the rain, and hopefully keep the front element dry, I decided to focus my attention on the rapids moving to feed the main drop of Linville Falls. The direction worked out perfect, and my lens stayed dry. I also was able to get quite a few compositions. I was still using the long lens, but I was starting to see some restrictions to my compositions using this lens for everything. So, I decided to go and check out one last section before switching out my lenses. The final twist and turn before the drop is always an interesting feature to photograph. There is a certain abstract aspect that is presented by photographing from a highly elevated position. There is not much here to visually anchor your eyes on, so it takes a moment to really find out what you are looking at. For me, that is the draw for this photograph. It is the third time I've photographed it, and the first time I really liked the outcome. Everything just came together so nicely for this one. 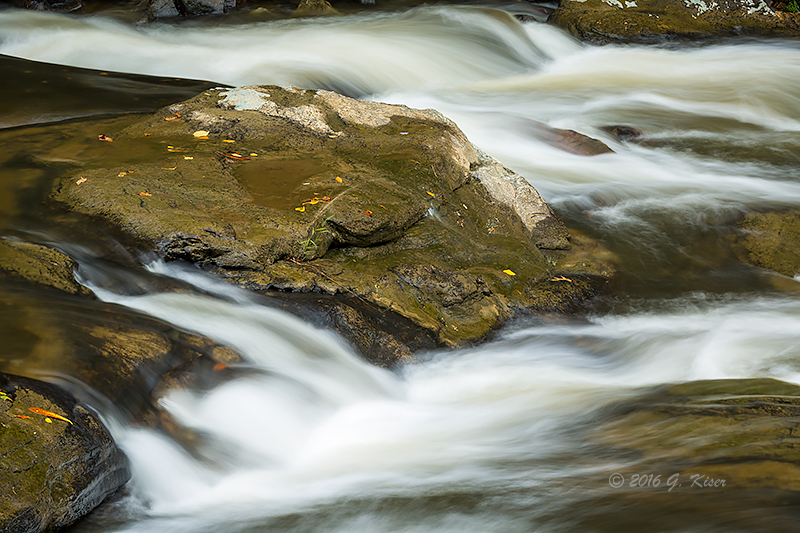 It was now time to swap lenses so I could entertain some different compositions with the water. 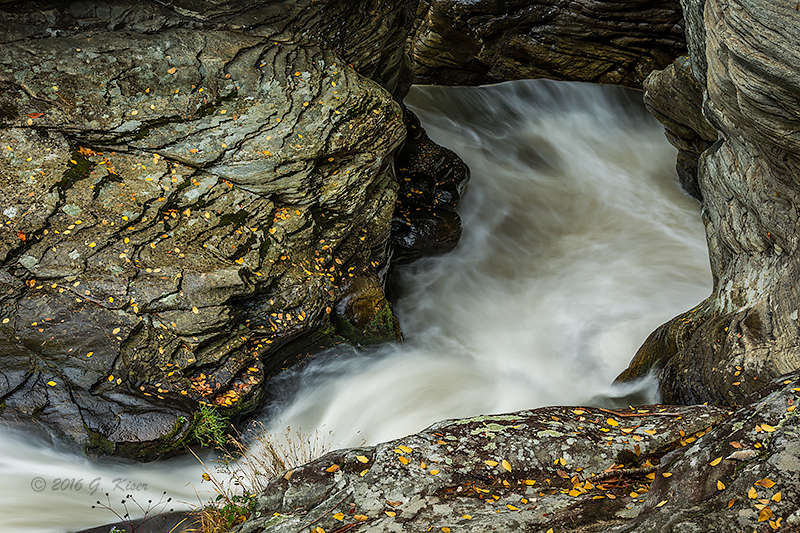 I started to work my way back to the twin falls, but I wanted to do some more with the rapids first. It is a very cool thing to look at a familiar subject with a different focal length. All of a sudden, new possibilities are opened up, and the scene in front of you is new once again. I started to let myself get a little more creative, and began working the water into larger compositions that incorporated the trees above...it was Autumn, after all. This one is one of my favorite from this part of Linville Falls. As with some of my other pictures of the morning, I had to do a good bit of waiting in order for the wind to stop blowing. The exposure was 1.3 seconds I believe, which is slow enough to show the wind blowing the vegetation around. Fortunately, the wind did cooperate, and I was able to get Autumn Rapids which showcases the beginnings of the Fall color in the mountains. Honestly, I just like the overall feel of this image. It is very relaxing to me. 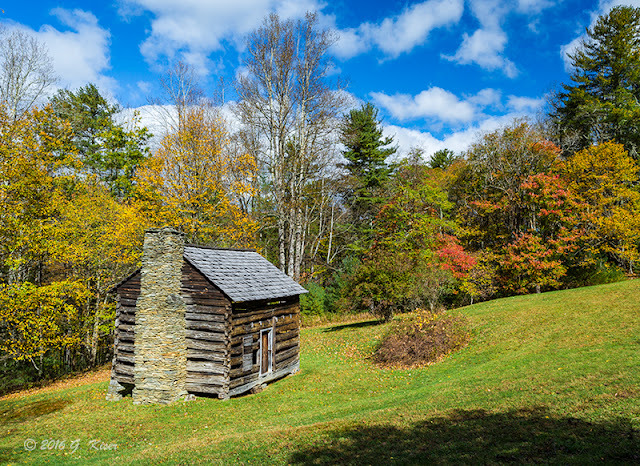 This one is another one of my favorites from Linville. Not only is the waterfall showcased, but I have a good bit of Fall color in the frame. It is another relaxing one for sure. I might have to choose between these two pictures to see which one gets printed and framed at some point in the near future. Not like I actually need more pictures, but it sure is fun to seen them printed out large, and then get them framed. After working the twin falls for a second time, I realized that I had gotten the goody out of this location. The fact that there were now about 50 people on the viewing deck, it was time to go. I thought about heading up to the other viewing platforms, but decided against it. I had seen the first two platforms while I was at the upper falls. Both appeared to be full of people on a rotating basis. This was not something that I wanted to get involved with at all. The decision was made to pack it in, and head on down the Parkway to see what else I could find. I got back on the Parkway headed South once again. I didn't have a destination in mind, but I was watching the sky, and checking for compositions I could utilize. I happened upon an overlook (can't recall the name) that had great skies and good viewing distance. There was just no foreground interest to be had. It was good enough to justify me getting out of the truck and seeing what was there to use. 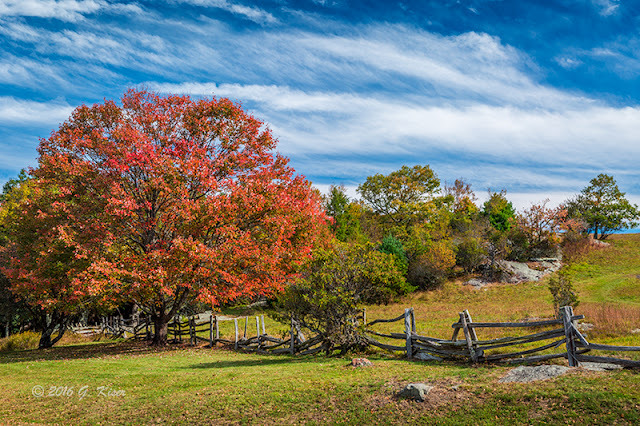 Much to my delight, there were a few trees that were brightly colored, placed in a location that I could use for that much needed foreground interest. I turned the truck off, and set the camera up. I would have loved to used the long lens, but I needed the wide angle of the 24-70mm in order to capture the colorful trees in the foreground. Without these trees, the composition would have been rather flat. Considering there wasn't nearly the amount of color that I was expecting for the areas I went today, I was actually kind of happy that the color was just patchy for these particular compositions. Had it not stood out among the sea of green, I would not have been able to make these compositions work near as well. The clouds from Hurricane Matthew were really helping with the drama of the sky as well. 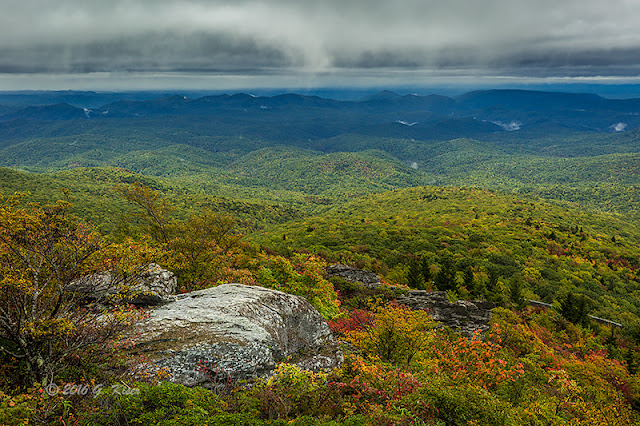 After Linville Falls, and this overlook, I was starting to feel really good about this Trek. Things were really coming together for me, and I was excited to see what was around the corner for me. Well, my next stop was just a few miles down the road and around the corner. Had I not been looking in my mirrors, I would have missed it, as I have many times in the past. 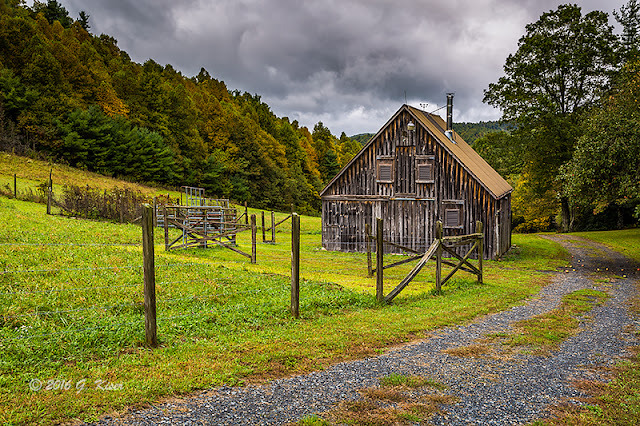 Tucked over a hill, well off the side of the road, I saw some bleached wooden walls of what could only be a barn. I stopped, and backed the truck up, pulling it off of the road. I got out and went over to the barn to see what it looked like. It was fenced off unfortunately, but I was able to previsualize a couple of compositions that could use the fence. I walked back to the truck and got the camera out....just in time for the rain to start. I went ahead and found the place for the tripod and set it up, hoping that the rain would quit soon. 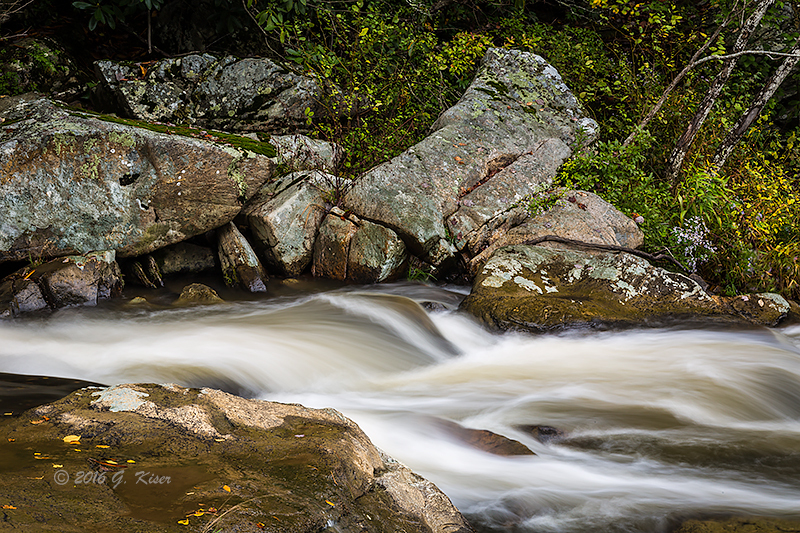 When it started to slow, I went ahead and built the camera with the 24-70mm lens, along with a polarizer. I had to leave the lens cap on though because the rain was coming right at the front element. When the rain paused for a second, I pulled the cap off, composed, focused, set the exposure and shot about 4 frames before the rain came back. While it didn't take much time to get this shot, I was sure hustling to make it happen while not getting the camera too wet. With the rain now coming down, it was time to move on to other things down the road. Again, I happened on another overlook with a tree that had changed already. While not a fiery red or orange, it was yellow, and that worked just fine. I had the foreground I needed, and I had some really ominous clouds to work with. The really nice bonus was the break in the clouds allowing the sun to shine through, and the rain visible in the distance. This was kind of a magical picture for sure, and it only took about 5 minutes to capture before it was all over. As I was nearing the end of my Trek, I found yet another overlook with some good clouds. The only problem was, I wasn't able to really find an interesting composition with the mountains in the distance. 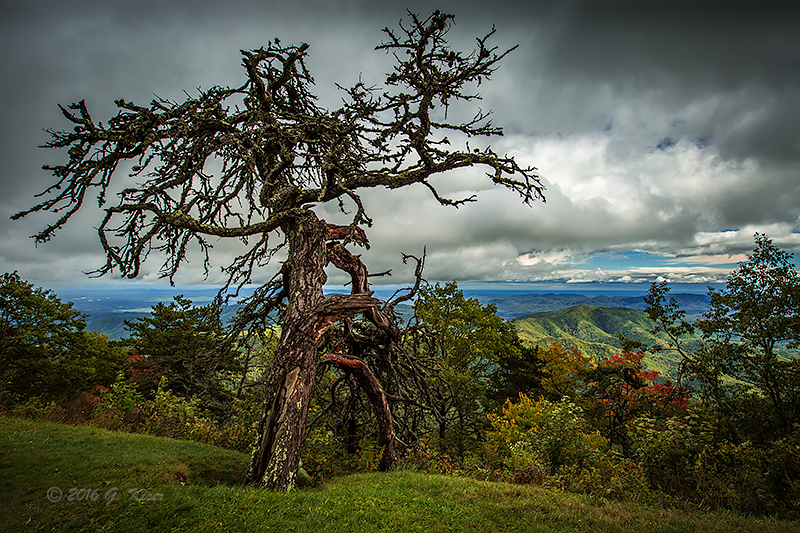 Just when I was ready to pack the camera up and call it quits, I saw this old tree right off of the parking area. I'm not quite sure how I missed it, but when I saw it, I could hear Toni saying "get it, get it!" The fact that it is shaped like a "T" didn't hurt either. I swapped my 70-200mm lens for a 16-35mm so that I could get the big tree in the frame without having to be in the parking lot to do it. The exposures were very difficult because of the lighting conditions, but I managed to make one work out very well I think. Just after I snapped this picture, a gust of wind came along and almost knocked my camera over, and blew off my hat. With that, I decided that it was time to go. At this point, I was closer to I-40 than getting back on US-421, so I worked my way onto I-40. 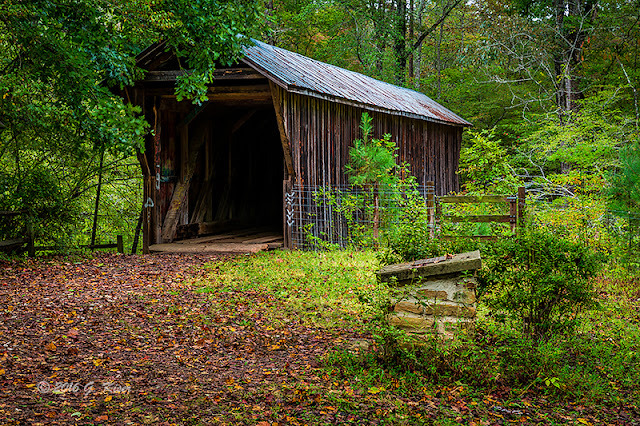 I knew that I was going to be going by the Bunker Hill Covered Bridge, and decided that it would make sense to go there on my way home. You see, I have a friend that has been after me to get a picture of it for quite some time. I was going to have good light, and the time, so why not? The bridge was not far off of the highway, so it took nothing at all to find. When I got there, I was a little disappointed in its condition though. There had been a great deal of vandalism to this bridge, and the spray paint detracted from the look of this historical landmark. I almost bypassed the shoot, but decided that I would go ahead give it a shot so that I could say that I have. I tried really hard to minimize the graffiti on the walls. Considering what was there, the picture turned out pretty good. I'm glad that I went at this time of year since the bare trees would make for an exposure nightmare later in the Winter. It didn't take very long since I was very limited in my compositional choices. With that, my Trek was over. I had been out since 4:30am, and it was now a little after 6pm. I was tired, and hungry. Now, at 3am the following day, my mind is shutting down. With that, I'm going to end this blog entry and hope that it makes sense. My mind wandered more than once, and I caught myself typing things that I said my dreams...that I had while typing. Yeah, I'm that kind of tired.